Perhaps as long as 5,000 years ago, a group of sailors found skulls belonging to a race of hideous giants whom the ancient Greeks named cyclops. Dwelling in their mythical land, entrusting the fate of their crops to their evil gods and devouring any humans they could find, these creatures terrified generations of Europeans. Today, relatives of these monsters can still be found — roaming the African savannas or the Indian jungles, or even eating peanuts from the hands of small children in city zoos. In fact, the ancient Greek sailors found elephant skulls. What they mistook for single eye sockets were the nasal openings for the elephants' trunks. Over the centuries, our understanding of mammals, both living and extinct, has improved considerably. Just the same, scientists have made some mistakes. 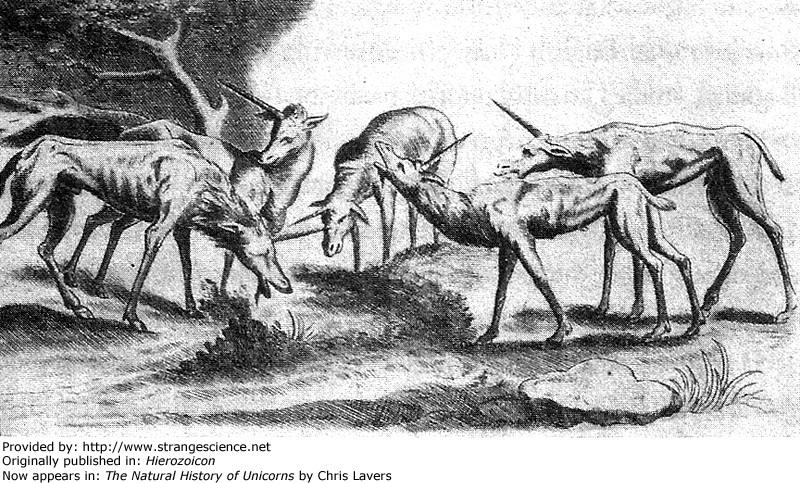 Unicorn "sightings" occurred throughout the world, but the mythical creature wasn't the same in each description. Not all unicorns resembled white horses with ivory horns. The Chinese unicorn was cow-shaped and scaly, or horse-shaped but with a dragon's head. The Arabian version looked like a rhinoceros but with a more elaborate horn. Some unicorns looked like lions, some were as big as mountains, some were as small as dogs. Some sported turtle shells. Some had a combination of hooves and chicken feet. Gifted with good taste, some ate only sugarcane. This picture shows just three variations — fairly pedestrian versions compared to their exotic cousins. From the Metropolitan Museum of Art: "Stamp seals were used in antiquity as marks of ownership and badges of status. In the large urban centers of the Harappan civilization, hundreds of square-shaped stamp seals were found in excavations. They are engraved with images of wild or domestic animals, humans, fantastic creatures, and possibly divinities. 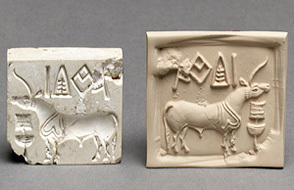 The bull is the most popular animal motif on the Indus Valley glyptic art. In this example, the animal is rendered in the typical strict profile, standing before what might be an altar. Its shoulder is covered by a decorated quilt or harness in the shape of an upside-down heart pattern. Most of the square stamp seals have inscriptions along the top edge. The Indus script, invented around 2600 B.C., is yet to be fully deciphered." 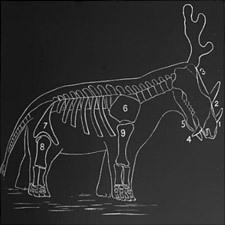 Lavers points out that scholars have long debated whether this image — appearing on about 60 percent of the Indus Valley's seals, according to a 1981 study by archaeologist Shereen Ratnagar — represented some kind of bovine in which one horn hides the other, or a unicorn. Either way, this often-copied creature might have been the mark of a ruling clan or class, and seals like this have been found throughout the Persian Gulf region. People in faraway lands would have seen such seals (or their impressions), and probably remembered and talked about them. Moreover, the seals' links to prestige might have fired some imaginations. 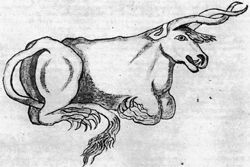 So even if this bovine creature with what looks like a single horn might not have been meant to represent a unicorn, it might have fueled legends of the beast. If seals from a great empire could convince the people who saw them that certain creatures were real, bas-reliefs on imperial grounds must have been even more effective. 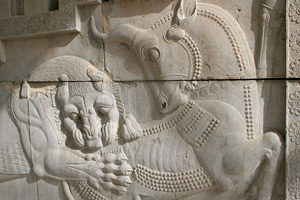 Visitors to Persepolis, Iran, an ancient capital of the Persian Empire, could feast their eyes on a lion feasting on another animal. But what was that other animal? Perhaps it was just a bull with two horns, one horn hidden neatly behind the other. Historians have debated whether artistic representations in perfect profile like this one were understood to mean two horns, or whether only one horn was intended. Either way, some visitors might have come away convinced of the reality of a single-horned creature. This is a fairly typical depiction of a unicorn with the possible exception of its cloven-hoofed, rather than horse-hoofed, feet. 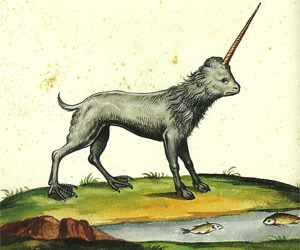 Although associated with purity and chastity, the unicorn was also said to be wily, and only captured through trickery. 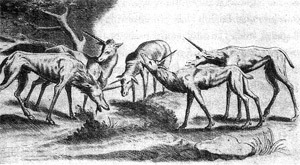 Coryate claimed to see two unicorns in his travels to India. As astronomer and science historian Owen Gingerich has observed, this woodcut is trimmed, which suggests that the picture was actually copied from an earlier work (perhaps Conrad Gesner's). 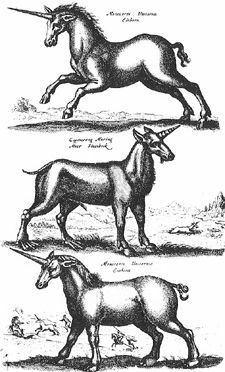 One reason unicorns held such fascination for medieval and Renaissance Europeans was that their horns, called alicorns, were thought to protect their owners from poison. Europe's royal families often acquired political power by poisoning their enemies, and some of the upper crust may not have been above testing their concoctions on their own family members. 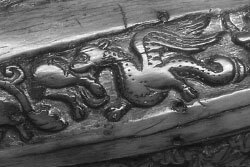 Unicorn legends may have existed since antiquity, but the most iconic images of the mythical creature arguably date from the Middle Ages, when the unicorn and other real and imagined life forms were all loaded with symbolism. 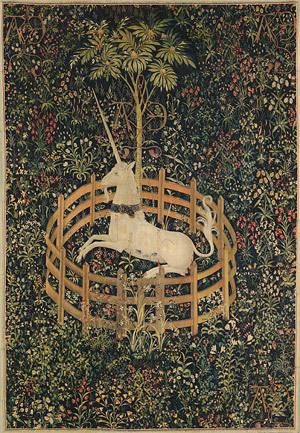 From the Metropolitan Museum of Art: "The seven individual hangings collectively known as The Unicorn Tapestries , are among the most beautiful and complex works of art from the late Middle Ages that survive. Luxuriously woven in fine wool and silk with silver and gilded threads, the tapestries vividly depict scenes associated with a hunt for the elusive, magical unicorn. The The Unicorn Tapestries may have been created as a single image rather than part of a series. In this instance, the unicorn probably represents the beloved tamed. He is tethered to a tree and constrained by a fence, but the chain is not secure and the fence is low enough to leap over. The unicorn could escape if he wished but clearly his confinement is a happy one, to which the ripe, seed-laden pomegranates in the tree—a medieval symbol of fertility and marriage—testify. The red stains on his flank do not appear to be blood, as there are no visible wounds like those in the hunting series; rather, they represent juice dripping from the bursting pomegranates above. Many of the other plants represented here, such as wild orchid, bistort, and thistle, echo this theme of marriage and procreation: they were acclaimed in the Middle Ages as fertility aids for both men and women. Even the little frog, nestled among the violets at the lower right, was cited by medieval writers for its noisy mating." In his book on sea monsters, Nigg explains that terrestrial animals were widely believed to have marine counterparts. So just as Europeans believed the world's vast ocean to host the sea cow, sea dog, sea hog and even sea rhino, it was also believed to host the sea unicorn. Considering many of the objects traded as unicorn horns were actually narwhal tusks, you could say it was a case of accidental accuracy. 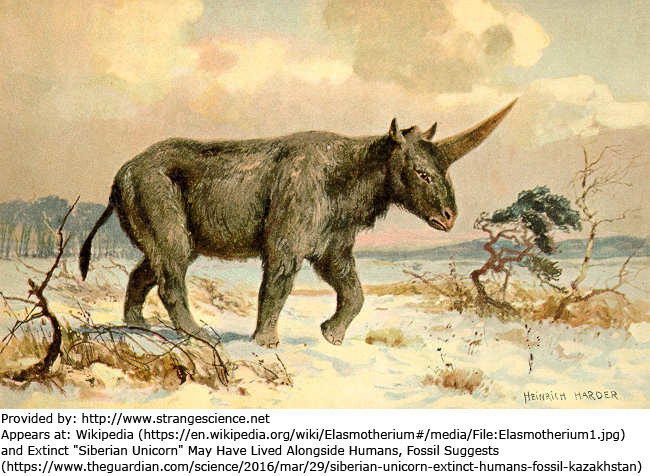 Nicknamed the "Siberian unicorn," the species Elasmotherium sibiricum evolved over 2 million years ago. Paleontologists had long believed the species went extinct 350,000 years ago, but a recent find of Elasmotherium fossils show that the species persisted until 29,000 years ago, meaning it might have bumped into the occasional Eurasian human. Since the late 19th century, reconstructions have shown Elasmotherium sibiricum with a horn on its head, based on skull features similar to those of a rhinoceros. 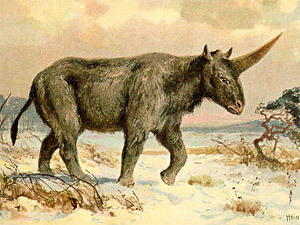 Modern paleontologists have not disputed that facet of Harder's illustration, but new reconstructions of the Siberian unicorn show an overall body shape resembling a rhino's, too, rather than this vaguely bear-shaped animal. 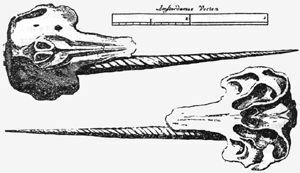 These narwhal skull illustrations have a minor error in that the furrows run clockwise, which they apparently don't do in nature. This small mistake, however, is more than offset by the much bigger mistake the illustration corrects. The adult males of these marine mammals have ivory tusks extending from the left side of the upper jaw. These tusks, often sold as alicorns, had long been believed to be unicorn horns. 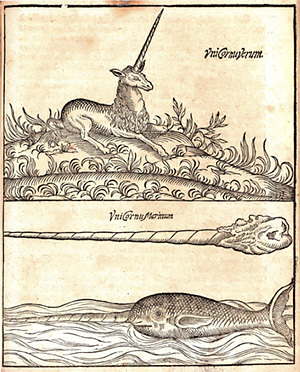 Centuries ago, trade relayed Narwhal tusks from Greenland to Europe, and en route, the narwhal tusks apparently transmogrified into unicorn horns, or alicorns. Some of the coveted alicorns were used by royalty to stave off poison; a description of a banquet held by Charles the Bold in 1473 listed half a dozen unicorn horns, a couple of them within arm's length of the duke. Other narwhal tusks found their way into church collections. One such tusk, a small snippet of which appears here, might have been used as a processional candlestick. This supposed unicorn horn is especially charming as it's carved in a pattern that fits nicely with the narwhal tusk's natural spiral, and the carvings include winsome dragons. The carving style suggests that it might date to the 12th century. Documentation about narwhal tusks in church collections is scarce, so modern historians can't be sure that this narwhal tusk was really believed to belong to a unicorn. Whatever medieval Europeans did or didn't believe about this specimen, it's easy to see why the traders involved in moving the tusks from northern oceans to Europe advertised the objects as they did. Poison-foiling alicorns were in demand. Nobody cared about narwhal tusks. 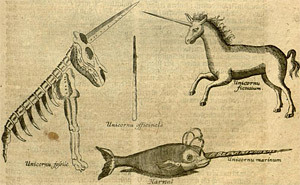 As 17th-century naturalists came to realize that some so-called unicorn horns were really narwhal tusks, the naturalists might have divided alicorns into a two-tiered system: "false" unicorns from narwhals, and "true" unicorns still believed to come from a semi-mythical terrestrial animal. Mammoth tusks might have served as the trusty alicorns. 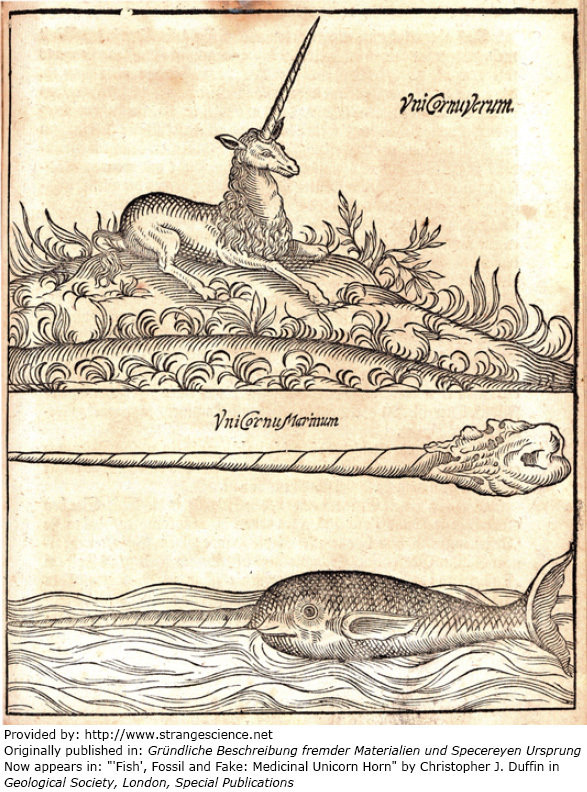 This illustration shows a terrestrial Unicornu Verum (top) and a marine Unicornu Marinum (bottom). While recounting the divisions between true and false unicorns, however, Duffin cautions that the situation was probably complicated, and opinions continued to differ about the identity of truly worthwhile alicorns. Born in 1599, Bochart undertook an enormous task: to analyze the nature and history of every animal mentioned in the Bible. 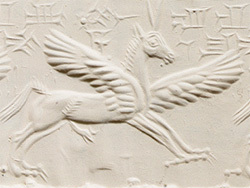 The holy book mentioned the unicorn, and although there are good reasons to think the unicorn was symbolic, Bochart took the references to it literally. He considered but decided against the rhino and wild ox, and settled on the "reem" or "rim." Readings of Near Eastern literature convinced him that there existed a kind of one-horned goat, and he figured that must be the animal he sought. Centuries later, Odell Shepard commented on the unintended consequences of studying zoology in the library. This 17th-century unicorn featured a flat face, a lion's mane, cloven hooves in the front and chicken feet in the back, and an accusatory pout. The savants working with these fossils were apparently so convinced unicorns must be real, they made one where it didn't previously exist. This "unicorn" was pieced together from mammoth and possibly rhinoceros remains found in a gypsum quarry near Quedlinburg. Von Guericke didn't publish a picture in his own book in 1672. Leibniz probably directed Seelander to style his rendering after images appearing in contemporary periodicals. The dotted lines indicate the animal's "missing parts." Misguided as it was, this was likely the first attempt to reconstruct a vertebrate fossil skeleton, but the poor thing wasn't even given hind legs. Early in the 18th century, Valentini authored a massive book about the contents of European curiosity cabinets, presenting a combination of realistic illustrations and lingering fancies. Daston and Park explain that, in this work, Valentini attempts to distinguish between true and false unicorn horns. This picture shows mixed progress. 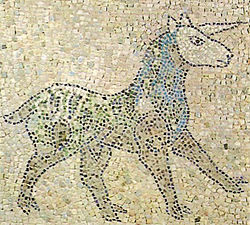 The caption for the traditional unicorn, portrayed in so many tapestries and woodcuts, indicates that it is fictitious. 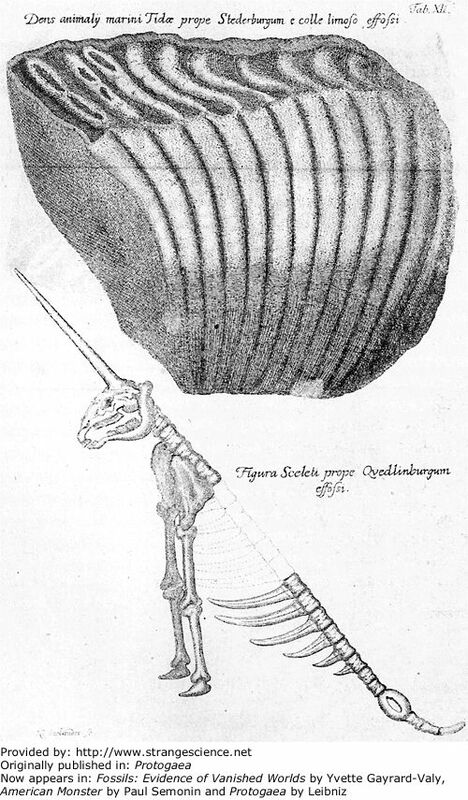 Valentini includes a narwhal, the actual source for unicorn horns. By the time this book was published, narwhal tusks had flooded the European market, causing the fabled poison-destroying alicorns to lose some of their mystique. 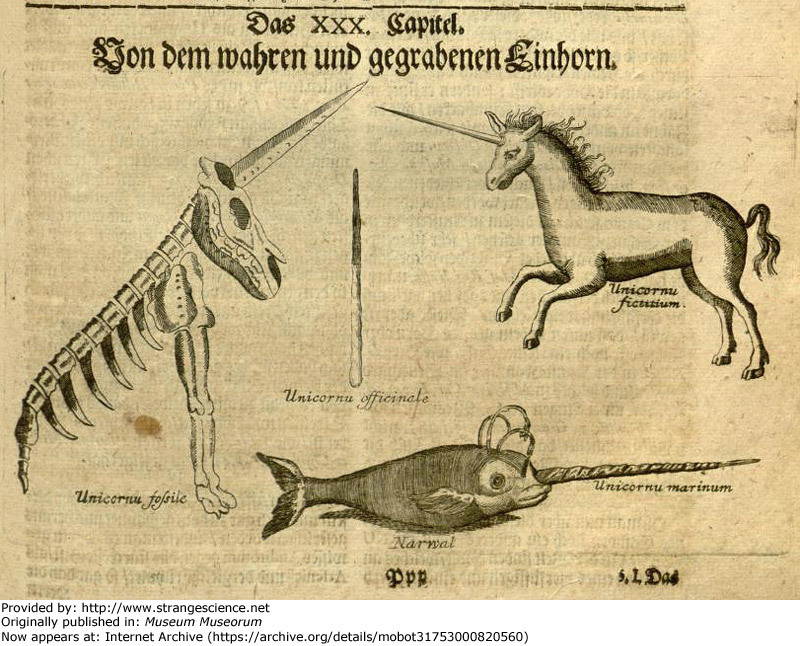 But the forward progress shown in this picture is offset by a "Unicornu fossile," likely based on the alleged fossil unicorn assembled by Otto von Guericke in the 17th century, and illustrated in Leibniz's Protogaea . This illustration of a mammoth tooth, which is very nicely done, appears with the fanciful unicorn shown above. 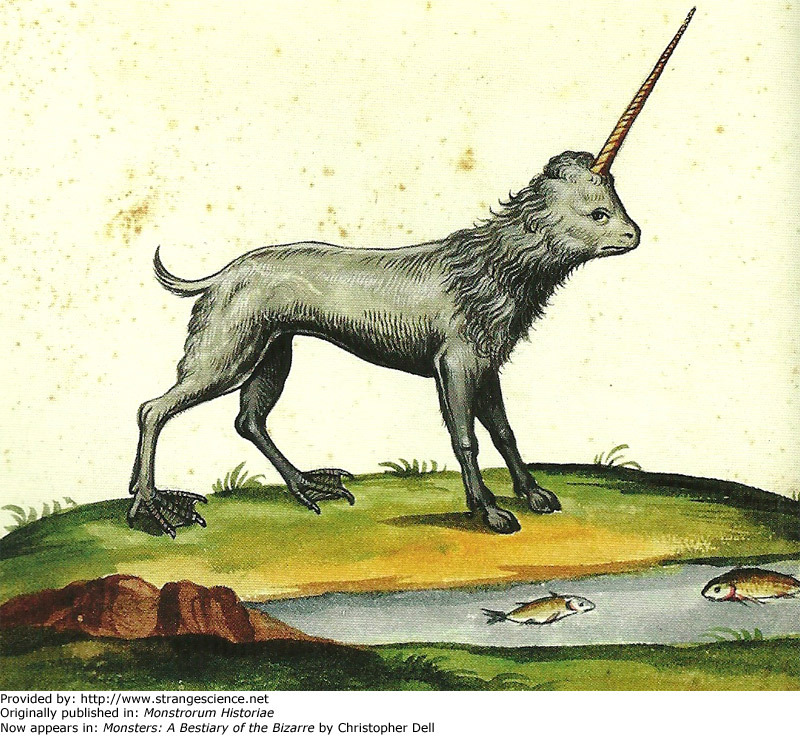 While this illustration is much more accurate than the unicorn, the label reads, "Dens animaly marini Tidae prope Stederburgum e colle limoso effossi," which is Latin for, "tooth of a marine animal excavated from a loamy hill near Stederburg." Vai notes the similarity between this illustration and a drawing in the collection of Renaissance savant Ulisse Aldrovandi. That label reads, "Dens beluae marinae ex terra visceribus in Russiae et Prussiae partibus effodi solitus ad lapideam substantiam conversus," Latin for, "tooth of a marine wild beast which is usually excavated from the interior of the Earth in Russia and Prussia after having been converted into lapideous matter." In 1815, the geologist William Smith published A Delineation of the Strata of England and Wales with a part of Scotland , a work hailed two centuries later for its originality and accuracy. Working-class Smith was smart, persistent, capable and innovative, but in Britain's highly stratified class system, that wasn't enough. Gentlemen geologists who believed themselves to be his superiors essentially copied his work without attribution, sold their map and a lower price, and helped ruin him financially. 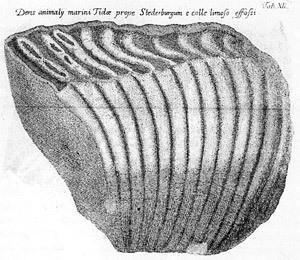 Delaying but not preventing a stay in debtors' prison, Smith sold off his beloved fossil collection, and wrote a companion catalog, featuring this engraving of a mastodon tooth. 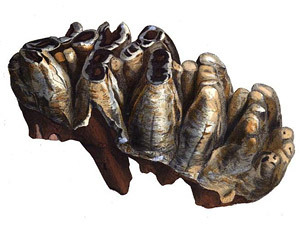 Smith described the tooth's owner simply as "some extinct unknown monstrous animal." If Smith made a mistake, it wasn't an error of misidentification but simply a lack of specificity. By the time he published Strata , naturalists on both sides of the Atlantic Ocean had recognized that elephant-like animals once lived in what were now temperature climates. 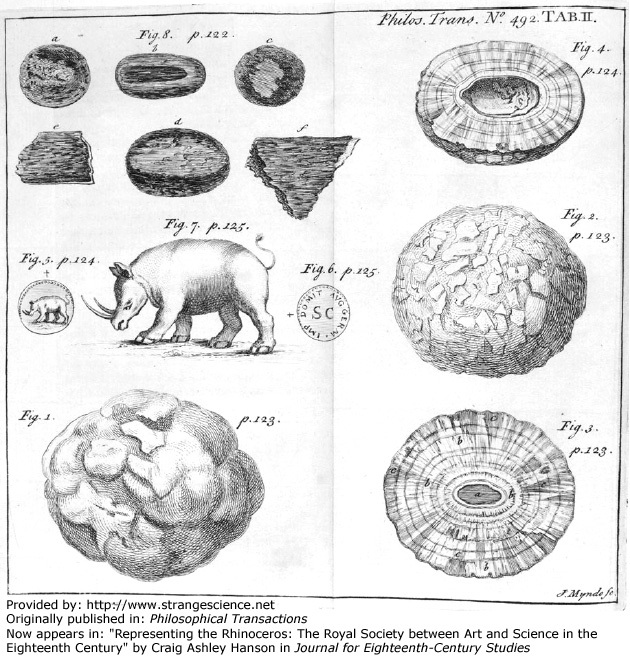 In 1806, Georges Cuvier had even authored a paper discussing the differences between mastodons and mammoths. But although the big mammals had been identified, they weren't much use to Smith. Primarily interested in identifying rock layers, he was more attuned to fossils that were abundant, and could be used to tell rock layers apart. Common types of invertebrate fossils were more use to him than rare mastodon molars. From the Metropolitan Museum of Art: "The gift of Nanette B. Kelekian included cylinder and stamp seals dating from the later fourth millennium B.C. to the Sasanian and Early Byzantine periods of the early first millennium A.D. The geographical range extends from Anatolia to Mesopotamia and Iran, with rich material from Syria and Cyprus. This seal can be dated on stylistic grounds to the late fourteenth to thirteenth century B.C., a period of intense interaction between the eastern Mediterranean world and the Near East: the modeled style and interest in movement are features associated with western stimuli." This horse goes one step beyond Pegasus with its clawed feet. With its mixture of bird and horse features, this creature might have been deliberately invented to represent a powerful individual or family, or it might have been based on a fleeting glimpse of a real animal. This was quite a robust and thoughtful fox, considering it could hold and contemplate a human head. 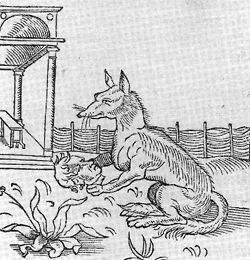 In fact, this woodcut appeared in a book about emblems, so this fox depiction was probably not meant to be taken literally. 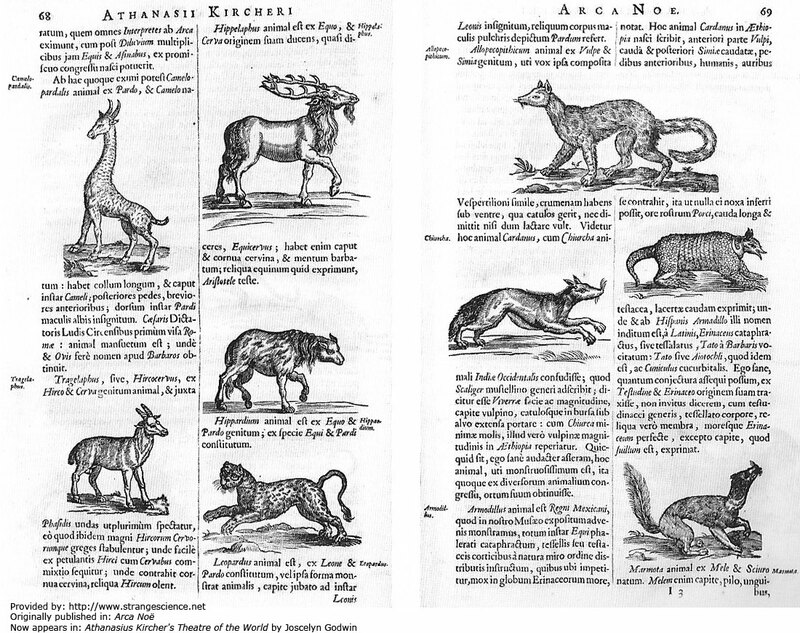 Not long after Alciati published his book, the famous naturalist Conrad Gesner published an encyclopedia of four-footed beasts, and the lengthy chapter on the fox not only pictured and described the animal, but enumerated its uses to people, and recounted just about every fox legend ever told. Olaus Magnus was just one of many naturalists who passed along fox folklore. This woodcut apparently conveys two 16th-century beliefs about the crafty animal. Foxes were believed to be tormented by flies and gnats (chances are, the people who wrote about them were). So, the story was, the fox solved this problem by getting a mouthful of hay and lowering itself into the water, hay still in its mouth. Once all the bothersome bugs had taken up temporary residence in the hay, the fox would open up its mouth and its multi-legged troubles would drift away. The fox was also believed able to catch crayfish with its tail. 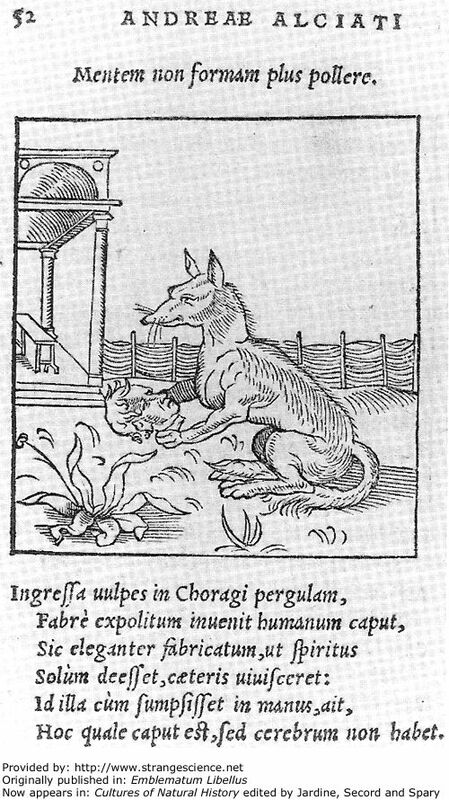 So this woodcut shows a fox getting rid of one group of arthropods while acquiring another. At the dawn of the 17th century, when a group of young naturalists near Rome decided to form a scientific academy, they chose as their totem the lynx. Members of the Lincean Academy may not have believed the legend that the animal could see through rock, but they did believe the lynx to be especially perceptive. Many Europeans believed the animal had another remarkable ability: peeing a gemstone capable of curing a long list of ills. Known sometimes as Lyncurium or Lapis Lincis, the lynx stone was really a crystal such as tourmaline or zircon, or a fossil such as belemnite or amber. Some naturalists said the lynx stone was like amber, which suggests they could identify amber separately. And not all naturalists believed in the lynx stone's curative abilities; Pliny for one doubted the lore. But for people who did believe, lynx pee turned to stone was amazing. Taken in various forms, it was thought to calm pregnant women and children, as well as treat scrofula (infection of the lymph nodes perhaps caused by bovine tuberculosis), gout, jaundice, digestive problems, poisoning, and heavy bleeding from menstruation and/or wounds. Hildegard von Bingen, an abbess and something of a medieval celebrity, extolled the virtues of this stone, but warned that if it was taken for ills other than chronic stomachache or painful urination, it would stop the heart and shatter the skull. Some said the lynx stored its coveted gemstone in the back of its throat, which would suggest the animal also knew how to suppress its own gag reflex. 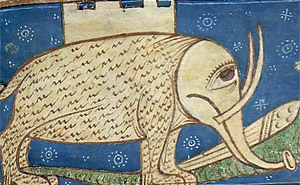 Unlike elephants or giraffes, hedgehogs were familiar to medieval Europeans, and this depiction shows a recognizable animal. But the behavior shown here isn't an accurate reflection of the animal's daily activities so much as a small morality tale to the reader. 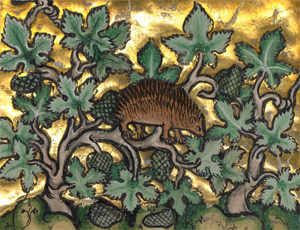 This hedgehog is gathering grapes, and the animal was said to impale the juicy fruits on its spines then scurry away. In this sense, the snuffling little animal symbolized the devil who could run off with one's poorly guarded spiritual truths. Topsell devoted over 40 pages of his Historie to man's best friend, and demonstrated that dogs were as loved in the 17th century as they are today. Besides tales of courage and loyalty, he passed tips for how humans could keep dogs healthy, such as, "If you give unto a dog every seventh day or twice in seven days broth or pottage in which ivy is boiled, this will preserve him sound without any other medicine." He also listed ways dogs could keep people healthy, pointing out, for example, that the "hair of a black dog eases the falling sickness." Like dogs, cats were very well known to medieval Europeans, so artists didn't make a lot of mistakes in cat likenesses. But while cats were domestic animals, there were never fully domesticated. Like cats today, they often did what they wanted, and manipulated their owners into giving them more of what they wanted. Europeans' mixed emotions about cats led to mixed treatment of them. They were valued for their ability to catch grain-munching mice, but also associated with witchcraft. While witches were believed to work their evil magic through a multitude of small animals, cats appeared to be their favorites. Feline habits of toying with their prey before making the kill reminded Christians of the devil's habit of toying with damned souls. Better treatment of cats started in the 17th century when aristocrats began keeping them not just as mousers but as pets. 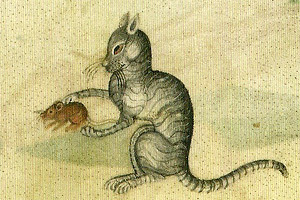 Before that, medieval manuscripts often showed cats doing what they were valued for: catching mice. This cat is a little bit off — too skinny front legs and an oddly shaped, perhaps stylized, head — but overall gives an accurate picture. Written descriptions could sometimes do the same. The Franciscan monk and encyclopedist Bartholomeus Anglicus characterized the domestic cat as "a full lecherous beast in youth" and "a right heavy beast in age and full sleepy." Sounds about right. Topsell got the overall shape of this herbivorous mammal right, although the proportions, such as head size and leg length, were a little off. What's most striking about this animal illustration, though, is its ferocious appearance. This animal has teeth suited to a saber-toothed cat, and sports a Klingon-forehead surface to its snout. 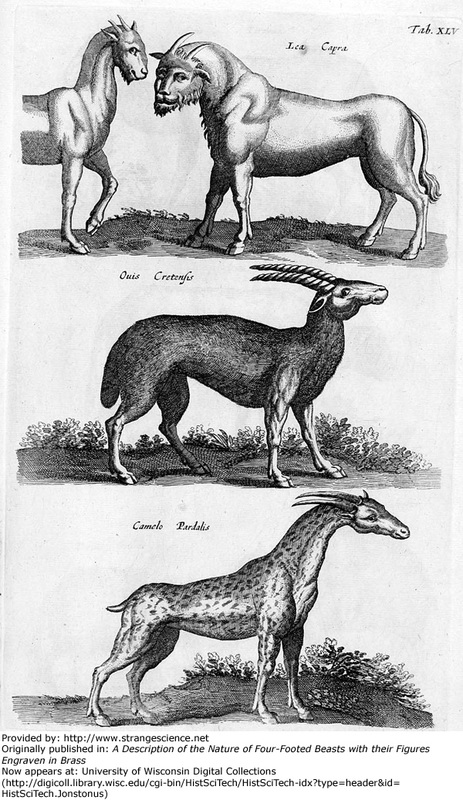 Topsell's antelope looks like a formidable carnivore. At the prehistoric settlement known as Akrotiri on the island of Santorini, perhaps the most thoroughly examined structure is the West House. It contains a miniature frieze playing up Minoan sea power. Part of the scene apparently intends to portray a north African landscape, but the lack of realism suggests that, even if the artist intended to be taken literally, he or she was working from the second-hand descriptions of others. The creature's spots and apparent stalking manner suggest it was some sort of feline. The Greek hero Heracles and Trojan princess Hesione jointly took on the Monster of Troy, a fearsome beast that appeared along the coast near Sigeum. The story was well known when Homer told it sometime around the eighth century BC. 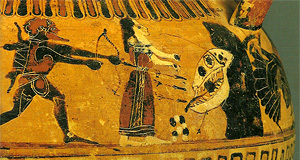 Around 550 BC, an unknown artist painted the scene on this vase, but with a twist. In a vase that otherwise provides realistic depictions of horses, geese, felines and people — although griffins put in appearances, too — the Monster of Troy looks weird. In fact, it looks like a skull, but not one belonging to any known animal. Folklorist Adrienne Mayor has argued that the skull might have been inspired by a real fossil, perhaps a prehistoric whale or giraffe. The bony eye ring might have been inspired by bird remains, from either living or extinct species. If so, then the artist might have rightly recognized a skull but wrongly attributed it to a contemporary monster. This creature looks a bit like a lion with a baboon's nose and mane well-tamed by conditioner. 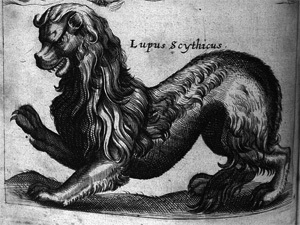 "Lupus," however, suggests that it's a wolf. "Scythicus" suggests it's from Scythia. A massive steppe that stretched from the northern shores of the Black Sea, past the Caspian Sea, to the mountains around the Taklimakan Desert, Scythia was populated during Antiquity by an equestrian society, which Herodotus described in his Histories. Archaeological finds have shed light on this ancient society, but even during the Baroque period in which Caspar Schott worked, Scythia was likely characterized simply as an exotic, far-off land with weird people and animals. 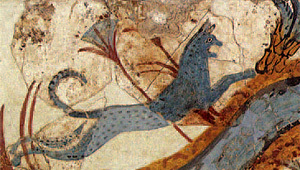 No wonder a Scythian wolf might look feline. 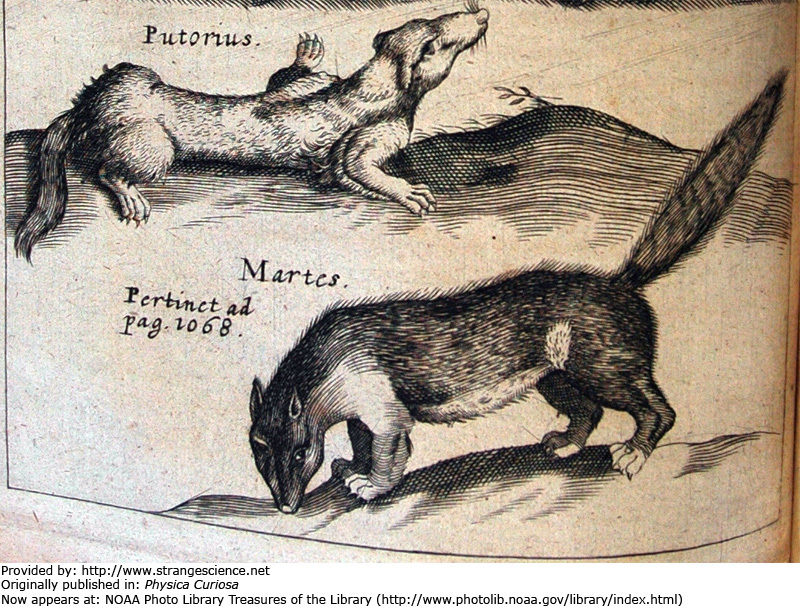 Two more creatures from Schott's menagerie included a martin (below) and a surprisingly long-nosed ferret (above). Despite the canine look to the ferret nose, Schott captured the animal's short legs and slinky body admirably. Although its head is a little small, this armadillo is pretty recognizable. What's more intriguing about this depiction is the explanation for the animal's strange appearance. Jesuit scholar Kircher devoted considerable time and energy to discussing the logistics of Noah's Ark, but by the time Kircher composed his various works, the discovery of the New World had presented a serious problem. So many previously unknown creatures threatened to sink Noah's boat. 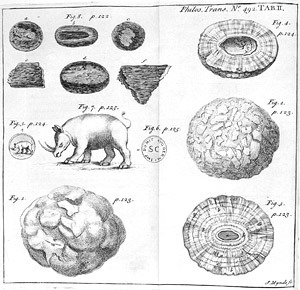 Kircher found a few workarounds: spontaneous generation for lowly creatures like bugs, adaptation for creatures ending up in strange environments, and hybrids. 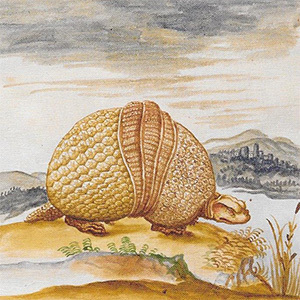 The armadillo, Kircher supposed, was a cross between turtle and a porcupine or hedgehog. Kircher wrote an entire book about Noah's Ark, and devoted Arca Noë to Spain's King Charles II, still a boy at the time of publication. Kircher fretted over growing skepticism about biblical narratives, including understandable doubts about whether Noah's Ark could have carried all the animals needed to repopulate the world. Kircher delved into the floorplan of the ark, even leaving room for chickens to feed the carnivores. But he also maintained that some species were not passengers on the ark; instead, they were hybrids. 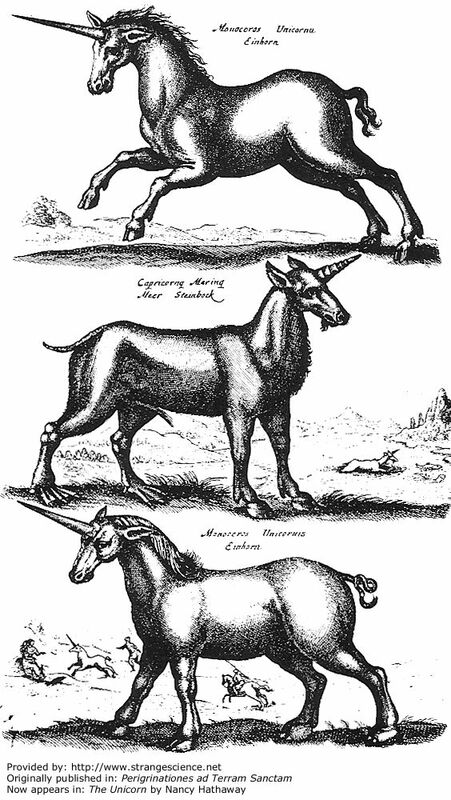 Whether Kircher believed this quadruped with a long horn on its snout to be one of those hybrids is hard to say. Kircher didn't doubt that different species could produce offspring, and his certainty helped get around the sticky problem of limited space on the ark. 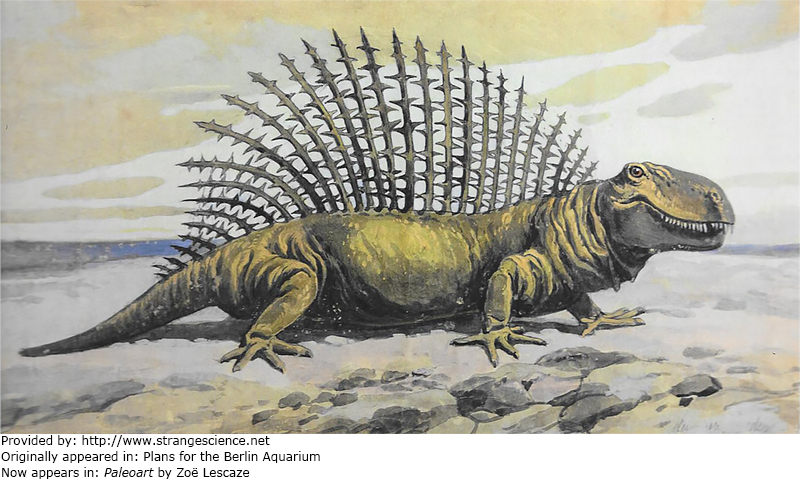 He gave numerous examples of animals that arose after the biblical flood receded. Besides the well-known example of the mule, he offered: Tragelaphus or Hirocervus from a goat and stag, Hippelaphus or Equicervus from a horse and stag, leopard from a lion and panther, Cameleopardalis (giraffe) from a camel and panther, Hippardium from a horse and panther, marmot from a squirrel and marten, Leocrocuta from a lion and hyena, Allopecopithicum from a fox and monkey (whose happy pairing frankly beggars belief), and the Chiurcha whose pedigree was fuzzy. Arca Noë featured woodcuts of many of his proposed hybrids. In the faraway land of Tartary, so the legend said, grew a lamb plant. Although he published a picture, Kircher didn't buy the legend. He did, however, find another plant-animal hybrid plausible: the barnacle goose. He argued that some waterfowl drop their eggs into the sea, waves churn the eggs into froth, and the resulting barnacles eventually cling to boats. The French East India company appointed Étienne de Flacourt governor of Madagascar in 1648, and charged him with ensuring good trade relations with the locals. That effort didn't turn out well, and Flacourt soon found he had better relations with the local wildlife. Even if the animals didn't reciprocate his affection, they didn't resent him as much as the people did. He documented animals partly or completely unfamiliar to Europeans with varying degrees of accuracy. The top animal shown here is the pygmy hippo, Hippopotamus madagascariensis. Flacourt's rendition has an overall bodily shape more like a dog's, but comparing his picture to the living, breathing animal is impossible now as Hippopotamus madagascariensis is extinct. Appearing next to the fish is likely an imperfectly depicted marine mammal. In the mid-17th century, the famed printer Matthäus Merian the Elder published a five-volume natural history of animals by the physician Joannes Jonstonus (John Jonston). The book copied illustrations by other naturalists, and repeated hearsay about the serpents, dragons and human-headed beasts pictured. Merian the Elder's daughter, Maria Sibylla Merian, later copied some of the illustrations to hone her own artistic skills. Maria — who would go on to become a printer in her own right, and a naturalist of considerable ability — would resolve to paint plants and animals "from life," and would travel to the jungles of Surinam to study caterpillars. Her studiousness would mark a significant departure from the naturalist whose work her father published. 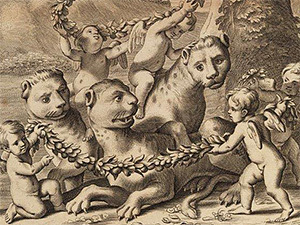 The creatures shown here, from a later Jonstonus work published in England, include a human-faced "Lea Capra" (top), and a leopard-spotted, horned, sweet-faced "Camelo Pardalis" (bottom). 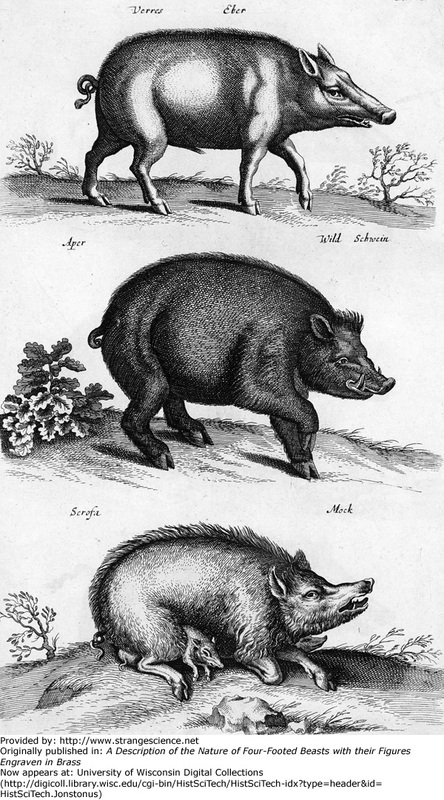 Three more creatures from Jonstonus's menagerie are boars, animals more familiar to Jonstonus and his fellow Europeans. 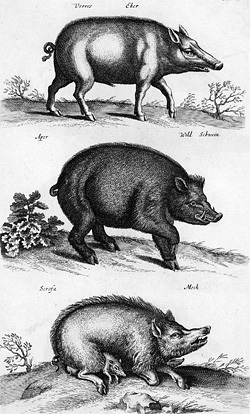 All three boars look menacing, which they probably really were. The bottom boar, looking after babies, looks particularly ready to take on two-legged troublemakers. The label for this animal reads "Leucurcuta," likely an alternate spelling of "Leucrota." 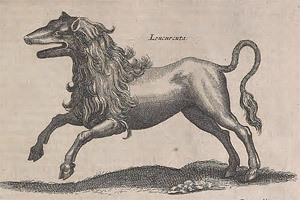 The leucrota figured in bestiaries many years before it appeared in Jonstonus's book, and was easy to identify by its mouth. You could say this creature could smile from ear to ear because its mouth was said to span that distance all the time anyway. But the leucrota wouldn't flash you a toothy smile; in the place of teeth, it was said to sport a plate of bone. 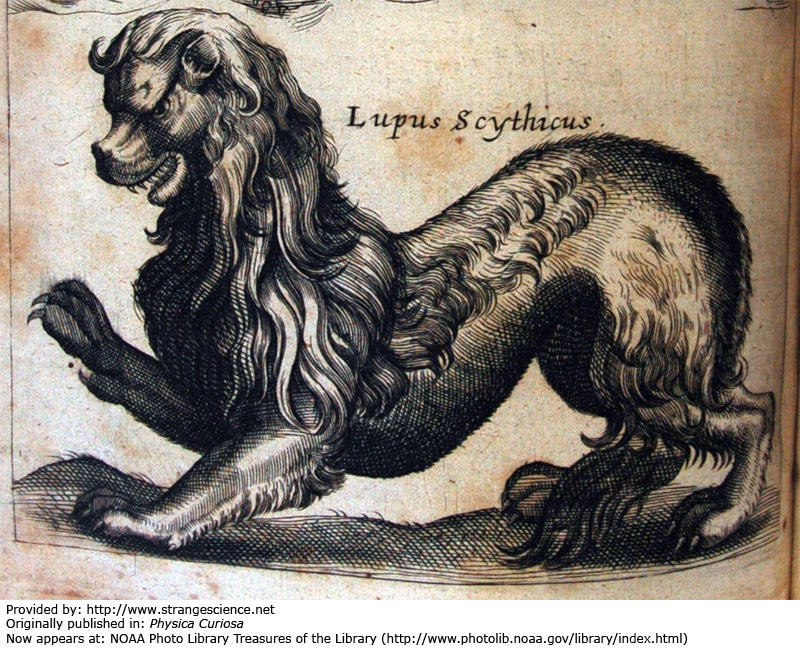 In fairness to Jonstonus, many of the illustrations in his natural history book were much closer to reality than this one; this illustration appears right above a picture of a recognizable lion. Jonstonus worked with the publishing house of Matthäus Merian the Elder and Matthäus Merian the Younger — father and elder brother to the pioneering entomologist and illustrator Maria Sibylla Merian. In the early 18th century, she would publish her own books of and set a new standard for accuracy based on first-hand observation. If the weather can rain cats and dogs, it can probably also rain rats. 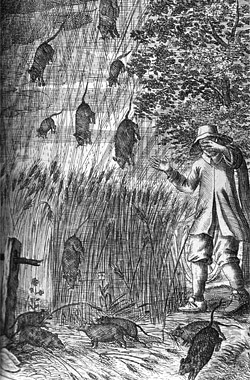 At least this depiction of rodents raining down upon a horrified farmer suggests the possibility. Believe it or not, powerful winds in a hurricane or tornado can lift animals (as well as trees and houses) off the ground and drop them elsewhere. Tornadoes forming over water may be able to loft fish into the air, simply to be deposited elsewhere later. Where a tornado would find so many rats, however, is hard to say. 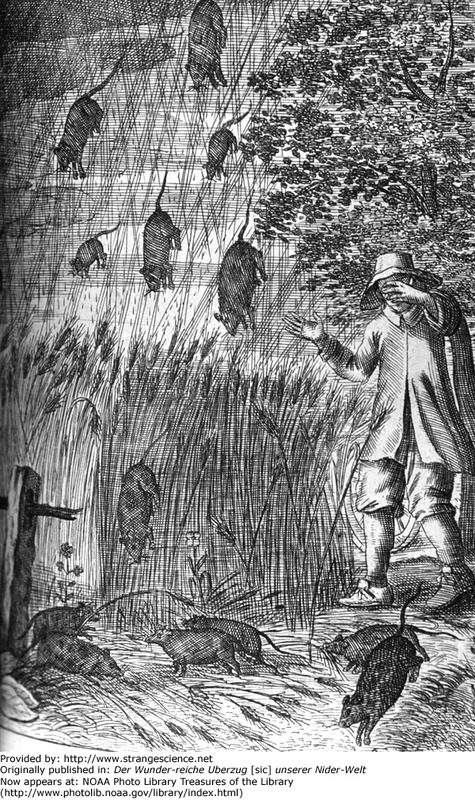 A much more plausible explanation for a 17th-century rat storm probably includes exaggeration if not fabrication. 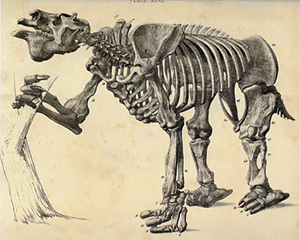 The skeleton that would be formally described as Megatherium turned up in pieces along Argentina's River Luján in 1787. The prehistoric jigsaw puzzle was soon relayed to the Royal Cabinet of Natural History in Madrid, where Juan Bautista Bru began overseeing its assembly in 1788. This was decades before any formal description of a recognized dinosaur, and although much more recent than dinosaurs, this elephant-sized ground sloth posed the same problems: It was big, weird, and extinct. Pieces of it seemed to belong to different species, but the fossil diggers only found one skull and four legs, indicating it really was a single individual. Some naturalists puzzled over whether the animal was terrestrial, aquatic or amphibious. And Bru was no naturalist. Historian Juan Pimentel recounts the materials Bru used in mounting the skeleton: "wire, polish, pitch, glue, white powder, cork, a hand saw, and files." After explaining that Bru employed a carpenter and a locksmith to help mount the skeleton, Pimentel continues, "Our bold taxidermist sawed, filed, and cut various bones, filled many others with cork, placed several of them in the wrong place, added others that did not even exist, and in general altered the anatomy of the big vertebrate to such an extent that the gave it an incorrect posture." This picture shows nowhere near the worst of Bru's work. By the time he made this sketch in 1796, the famous French naturalist Georges Cuvier had learned of the strange skeleton, and published his own analysis of it. 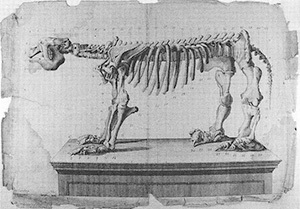 In his own analysis, Cuvier corrected some of Bru's more egregious blunders, including confusing the animal's front and rear legs. Cuvier's interpretation of the animal almost certainly influenced this later sketch by Bru. Even so, Bru appended to the Megatherium an unmerited mule's tail. 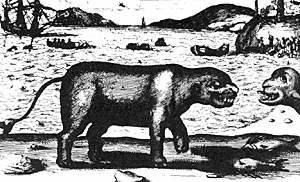 By the time Buckland published this depiction of Megatherium, the extinct mammal had been reworked extensively from Juan Bautista Bru's late-18th-century mount in Madrid. Cuvier corrected some of Bru's initial mistakes, and Pander and d'Alton improved upon Cuvier's work, so much so that Cuvier replaced Bru's imagery with Pander and d'Alton's in his 1823 edition of Recherches . 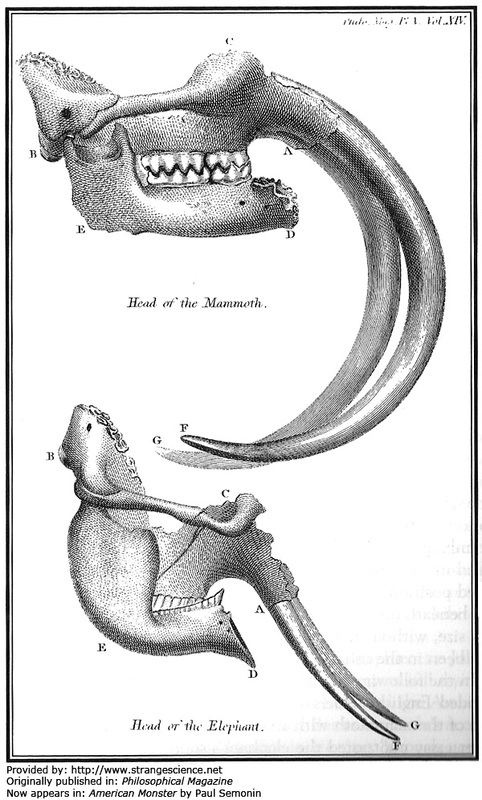 This image from Buckland's book is also closely modeled on Pander and d'Alton's publication, which they released in 1821. 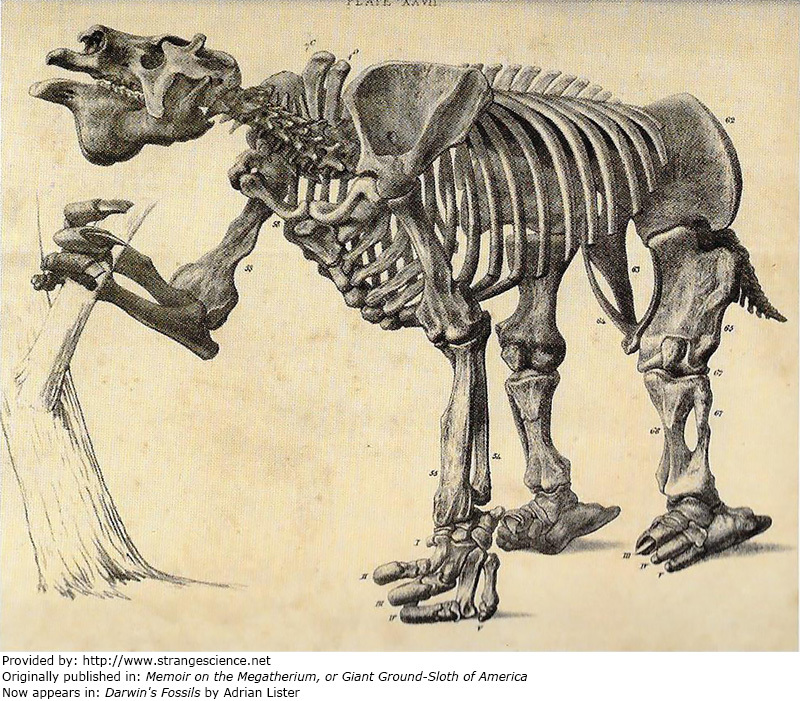 Comparative anatomists made incremental improvements to Megatherium posture over time, and Richard Owen's research contributed to that effort. For one thing, he corrected an earlier mistake by French naturalist Georges Cuvier, who attributed armor from glyptodonts to giant ground sloths. 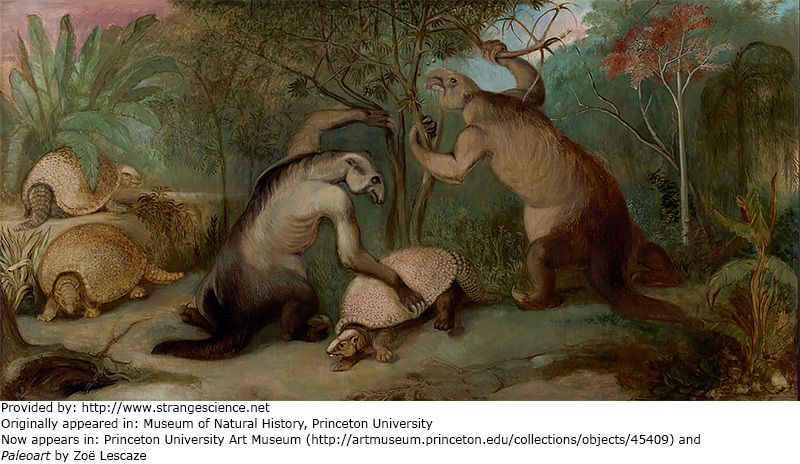 This mid-19th-century ground sloth rendition accurately showed the animal resting its weight on the outsides of its feet, but Owen hadn't yet noted that the animal's massive tail would enable it to make a tripod of its tail and hind limbs. That upright posture took over later Megatherium reconstructions, including work Owen oversaw at Crystal Palace Park. The South American fossils Owen studied were collected by someone Owen would later view as an enemy: Charles Darwin. When the two were young, however, they were friends, and at a time when dinosaurs hadn't broken through to the public's consciousness, giant fossils mammals were everyone's favorite prehistoric monsters. Thomas Jefferson and Georges Buffon were freethinkers with a genius for scientific research, but in the late 18th century, they disagreed. Buffon convinced himself that "a niggardly sky and an unprolific land" in the New World left its human and animal inhabitants measly. Jefferson begged to differ, and marshaled all the evidence he could. In the case of the animal he dubbed Megalonyx or "Great Claw," he overreached. 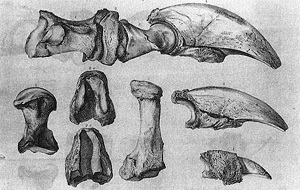 Jefferson described fossil bones discovered in western Virginia, identifying a femur fragment, radius, ulna and three claws. He claimed that the bones likely belonged to a lion, and with apparent glee pointed to Buffon's own measurements of "a large lion of Africa" to support his argument. Calculating the animal's overall size from bone fragments (not as unreasonable as it might sound — so long as the animal is correctly identified), Jefferson proclaimed, "Let us only say then, what we may safely say, that he was more than three times as large as the lion." Remains of such a big beast no longer roaming the Virginia countryside raised the question of where the animal now lived. He had a handy explanation: "Our entire ignorance of the immense country to the West and North-West, and of its contents, does not authorise us to say what it does not contain." (Jefferson didn't much care for the concept of extinction.) But before his paper was published, he received some surprising and perhaps disappointing news, and hastily revised his paper. The skeleton of a big quadruped had been dug up in Paraguay. "The megatherium is not of the cat form, as are the lion, tyger, and panther . . . it probably was not carnivorous, had not the phosphoric eye, nor leonine roar." The anatomist Caspar Wistar eventually named Jefferson's bones Megalonyx jeffersonii. Jefferson was wrong about Great Claw, but Buffon was wrong about New World animals. The Paraguay animal wasn't a big cat but it was indeed big; it was a giant ground sloth. And any lingering skepticism about the size and ferocity of New World animals would have died in the claws and jaws of grizzlies encountered by Lewis and Clark and Company in the early 19th century. In fact Jefferson's 1799 paper attempted to advance an argument he had largely already won. Buffon died in 1788, and before his death he conceded Jefferson's point that American wildlife could be as big and robust as European wildlife. Buffon pledged to amend Natural History but died before he got around to it. Around the time that Cuvier and Bru accurately reconstructed an extinct sloth, a newly published book showed 17th- and early-18th-century struggles to understand an extant one. Some aspects of this reconstruction, including the snout, claws and overall body proportions, aren't bad. But the shoulder-length mane puzzles. A delay in publishing perhaps preserved ideas that the authors might have discarded by late 18th century; by the time this book was printed, Catesby had died, and George breathed his last in 1773. Thomas Jefferson worked doggedly for years to refute the French naturalist Georges Buffon's conviction that New World inhabitants were scrawny. Jefferson eventually succeeded by marshalling multiple lines of evidence. American rocks yielded plenty of fossils of big animals, but they were long dead — extinct, in fact, though Jefferson hated the idea. 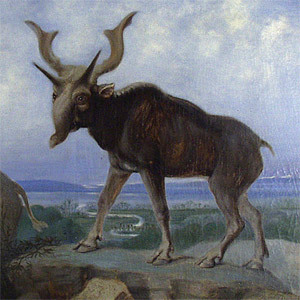 His disdain for extinction aside, Jefferson wanted a specimen that lived during his own day, and perhaps his prize specimen was a moose, acquired for him by a Revolutionary War General John Sullivan. Notified of the moose find, Jefferson assured Buffon that a European reindeer could walk under the belly of his American moose. One likes to think Jefferson said the reindeer could do so without leaving so much as a scratch. He followed up the assurance with the physical specimen. Printed in New York, this broadside appeared years later. The overall look of this moose is accurate, but the ad boasts that the moose might be as much as 12 feet high. Considering the moose Jefferson relayed to Buffon was measured at 7 feet tall, this claim is likely exaggerated. Then again, it is an advertisement. This is not a goof. In fact, it's a meticulous depiction of skeletal anatomy, and it was part of a book loaded with such examples of accuracy, artistry and charming weirdness. Many of the illustrations in Osteographia, or Anatomy of the Bones, appeared inside ornate engraved frames. Perhaps more importantly, Cheselden strove to show the animals in lifelike poses and realistic settings. It doesn't take a degree in osteology to figure out which two domestic animals miss their fur and confront each other here. In aiming for the greatest possible accuracy, Cheselden dropped the original sketches made for the work and instead ordered Vandergucht and Schijnvoet use the camera obscura. Unfortunately the book was a financial failure when it was published in the 18th century. It has since achieved something closer to the respect it deserves. 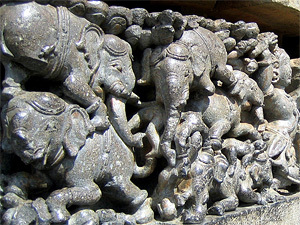 Temple sculptures in Belur commemorate the Indian epic Mahâbhârata, including an apocalyptic battle that left scores of elephants dead and dismembered. Bheema (or Bhima), a mythic figure in the epic, was reputed to have the strength of 1,000 elephants. So it was little trouble for him to kill the powerful animals and toss their bodies into a heap, and such hapless elephants appear in this wall sculpture. In fact, the epic battle myth might have been inspired by real fossil remains in the Sivalik (also spelled Shivalik or Siwalik) Hills. The Sivalik Hills extend from northern Pakistan across northwestern India, Nepal, and northeastern India, ending in Bhutan. In the 19th century, spurred by mythical tales about the region, paleontologist Hugh Falconer started excavating. In a single day, he managed to collect more than 300 big bones. By the time he was done digging, he had unearthed literal tons of fossils, including the remains of fossil proboscidians. Paleontologists figure that the remains were deposited by rivers and streams starting during the middle Miocene and later uplifted by seismic activity. Other legends associated with the area said that "Sivalik dragons" had jewels in their skulls, and Falconer found that many of the fossils in fact held large calcite crystals. Describing dinosaurs as well as big mammals and birds, H.N. Hutchinson's book about extinct animals was popular enough to merit multiple editions. In the 1897 edition, in the chapter titled "Some Indian Monsters," Reverend Hutchinson sang the praises of Hugh Falconer and Proby Cautley, who excavated fossils in the Sivalik Hills, the southern foothills of the Himalaya, in the 1830s. 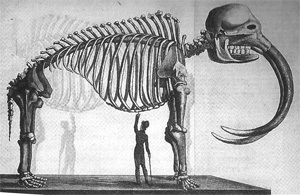 Hutchinson included illustrations of the fossil booty, including this image of Sivatherium giganteum with "an allied form, Helladotherium," in the background. Hutchinson and Smit's reconstruction was partially correct; the fossil skull clearly bore bony protrusions. But whereas modern reconstructions show an animal looking similar to a modern giraffe or okapi, Hutchinson's book pictured something similar to a moose. 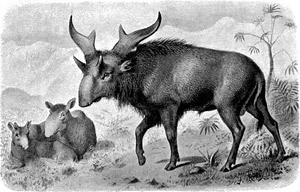 Sivatherium giganteum lived in Asia during the Pliocene and Pleistocene epochs. Now understood to resemble a supersized modern okapi with an extra pair of horns, the mammal was, in the 19th century, often portrayed as similar to a moose. 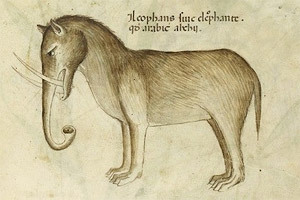 The moose-like appearance here is hard to miss, although Benjamin Waterhouse Hawkins has given his version of the animal an even stranger appearance, with a bulbous snout ending in what looks like a stunted trunk. His Sivatherium looks like something you might encounter in a Star Wars cantina. Originally published as: "Struggles of Life among British Animals of the Primæval Times"
Following the popularity of his Crystal Palace reconstructions of the early 1850s, Hawkins released a series of educational wall posters. Besides dinosaurs and pterosaurs, he illustrated much more recent mammal life. Working with James Tennant, a geology lecturer, Hawkins produced a pamphlet promoting this poster. The pamphlet described "troops of ravenous Wolves, driving whole herds of Elks and Deer." In the midst of the hunt, the mammoth would be "entangled in the melée, panic-struck, and attacked on all sides," and would be an easy target for "the fangs of the Cave Lion or Scimitar-toothed Tiger." 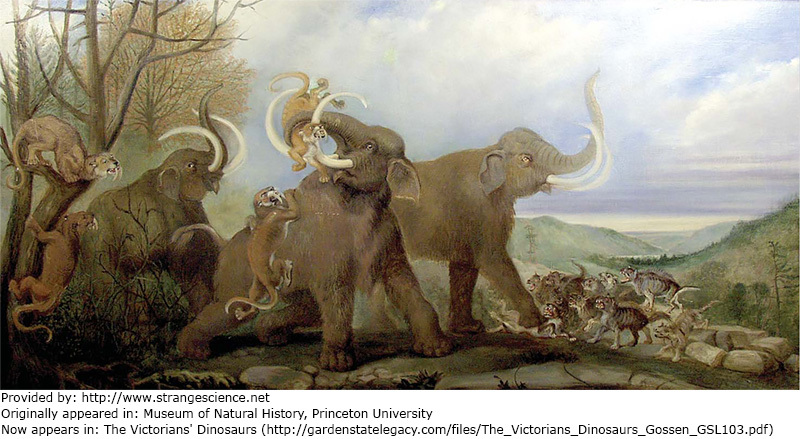 In this picture, though, the saber-toothed cat looks like the one with reason to panic; it's tangled up in the mammoth's tusks and trunk. Serving the purpose of showing numerous animals, a whole menagerie conveniently crowds into this scene, including a hippo, a musk-ox and an Irish stag. One has to wonder why these tasty herbivores don't beat a hasty retreat; if the felines don't kill them on purpose, the mammoth might toss them by mistake. 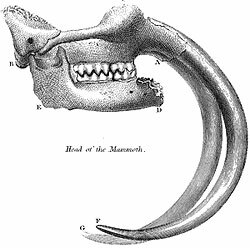 Hawkins opposed evolutionary theory, yet his illustrations promoted "Nature red in tooth and claw" as envisioned by some evolutionists. Canadian geologist J.W. 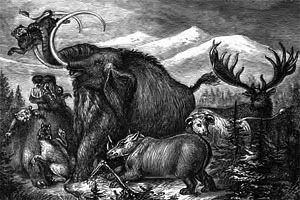 Dawson, who also favored creation over evolution, saw fit to reproduce this picture in his 1873 edition of The Story of the Earth and Man . 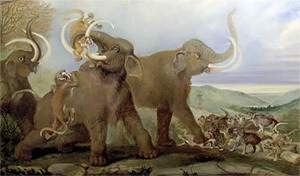 Titled Attack in Pleistocene England , this painting was part of Waterhouse Hawkins's final commission. At Princeton University, he painted 17 huge canvases, and 15 of those paintings survive. This scene borrows from a poster he made earlier, just with a slightly different configuration. Poor proboscideans are set upon by saber-toothed cats on one side, and hyenas on the other. In contrast to his earlier posted, cats hunt as a group, and appear to have a better chance of winning. So do the hyenas. 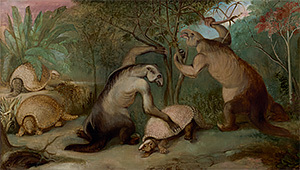 Titled Pleistocene Edentates of Patagoni , this painting shows ground sloths feeding while glyptodonts wander underfoot. As Waterhouse Hawkins aged, his paleoart showed scenes that were more confrontational. Maybe the darker mood in his art was the consequence of his conflicts with Boss Tweed in New York City, or his messy personal life. These ground sloths are pretty accurate anatomically, though a little less stately than the Megatherium he designed for Crystal Palace Park. One of the sloths lays a hand on a passing Glyptodon, for reasons that aren't entirely clear. Though his paintings generally showed more strife and even violence in the 1870s, Waterhouse Hawkins still painted calm, stately scenes. 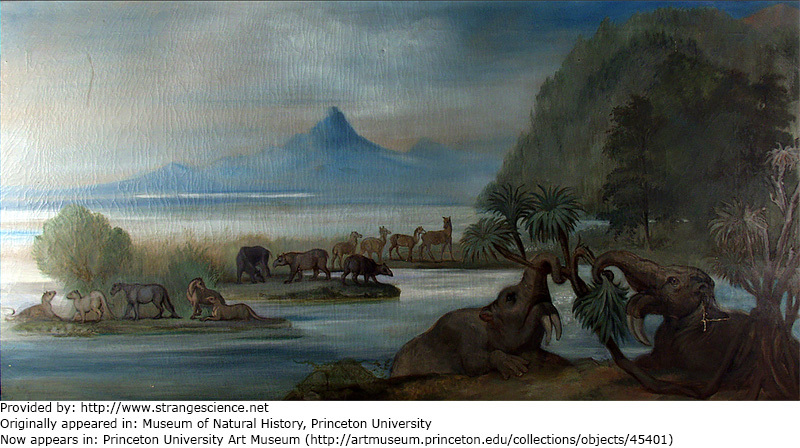 In this painting, titled Tertiary Mammals of Europe , prehistoric animals congregate in a small area for the convenience of the viewer. In the background, they march single file so that each individual presents a good profile. In the foreground (visible in the expanded image), a pair of proboscideans dismantles palm trees. 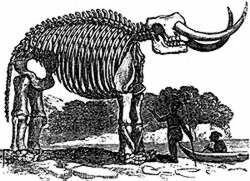 It looks like early American scientists had a little trouble figuring out just where to put the tusks, though this rendering may have more to do with the artist's faulty memory than the articulator's bad judgment. Peale turned the tusks upside down, however, in later articulations. 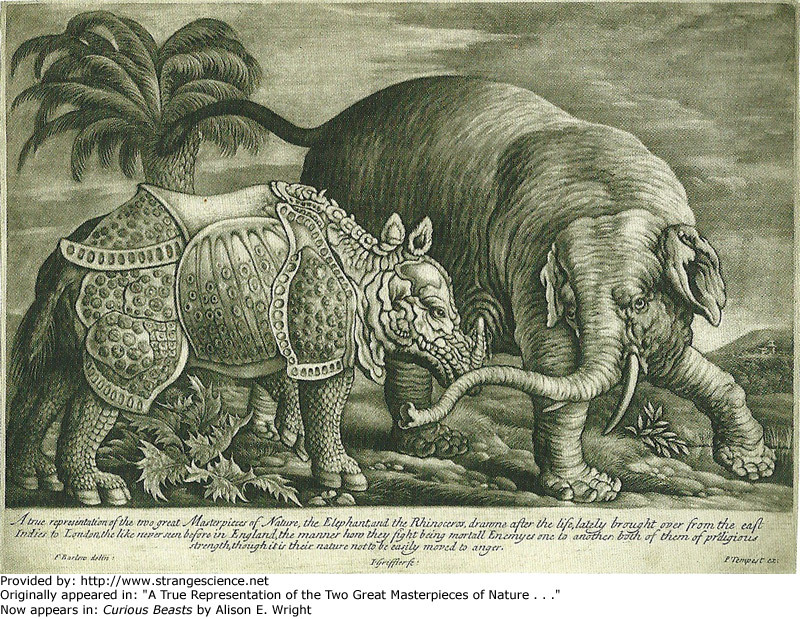 Despite the vegetarian diet of modern elephants, Rembrandt Peale was convinced that the prehistoric creature known in the early 19th century as the incognitum had been carnivorous. He gave considerable thought to how a carnivorous animal — that would need to tear apart its prey, and also dig up tasty shellfish hors d'oeuvres — would need backwards-facing tusks well-suited to those tasks. He apparently didn't give as much thought to how such a creature would walk without injuring its front legs on its own tusks. Rembrandt Peale's father, Charles, acquired three specimens of fossil proboscidian in 1801, and he put the best one on display in his museum. 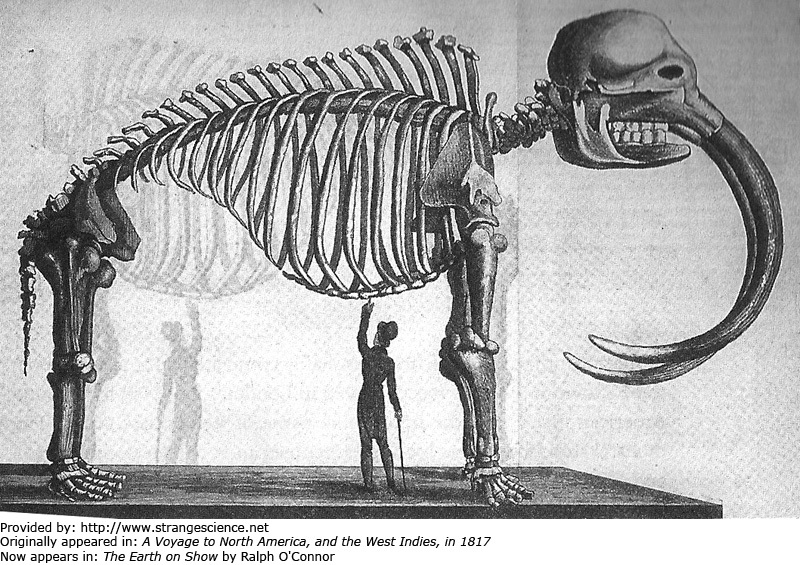 This picture shows the articulated skeleton of a "Young Mammouth" (actually a mastodon) with a grown man under the belly to give an idea of the beast's size. Before the discovery of recognized dinosaurs, the tusked creatures satisfied the public's appetite for ancient monsters. This ancient monster would have needed a mighty tough pair of front legs. To the now-anonymous Swedish soldier who trekked across Siberia in 1722, a mammoth apparently looked an ox with braided horns and clawed feet. Over the next century, a much clearer picture of the mammoth emerged from the mists of deep time. Although slightly stiff and misshapen, this woolly mammoth is much closer to our modern understanding of the extinct mammal than the ox-like creature portrayed a century earlier. The caption identified it as Elephas primigenius, part of the elephant family. After the species was originally designated by Johann Friedrich Blumenbach, it was reclassified as Mammuthus primigenius. By the time naturalists realized that wooly mammoths had once roamed the Siberian steppes, local people had long traded fossil ivory. Around the turn of the 19th century, a Siberian chief named Ossip Shumakov found two beautiful ivory tusks still attached to a relatively intact animal. Besides the skeleton and tusks, this mammoth still had much of its soft tissue. Shumakov told an ivory dealer, Roman Boltunov, who sketched the animal before taking the tusks. Not long afterwards, a naturalist, Mikhail Ivanovich Adams, visited the site. Scavengers and human hunters largely de-fleshed the proboscidean before Adams examined it, and if this image is any indication, the trunk was gone by the time Boltunov produced his sketch. But along with other parts of the animal, including nearly 40 pounds of wooly hair, Adams managed to recover an ear. Aside from the missing trunk, the tiny ears high on the head are perhaps the most jarring aspect of this sketch. 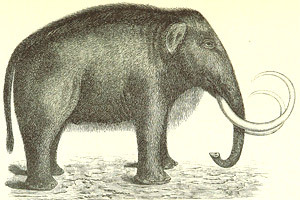 Compared to modern elephants, mammoths had small ears, needing to conserve rather than radiate heat, but they weren't as tiny as this sketch implies. 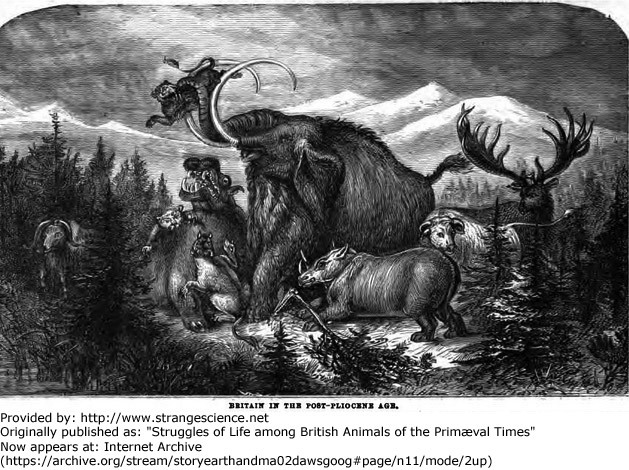 It's possible that scavengers had already nibbled the ears by the time Boltunov saw the mammoth. It's possible that the frigid conditions that preserved so much of the animal also distorted some appendages. And it's possible that, in making a hasty sketch of an extinct animal, Boltunov simply messed up a few details. Overall, the sketch is very good. This image, available via Wikipedia, also bears notes written by Johann Friedrich Blumenbach. Boltunov contributed more than a sketch to our understanding of this animal; he sold the tusks he had collected to Adams. Adams shipped the tusks and other pieces of the animal he was able to collect to St. Petersburg, where he made a living teaching botany. 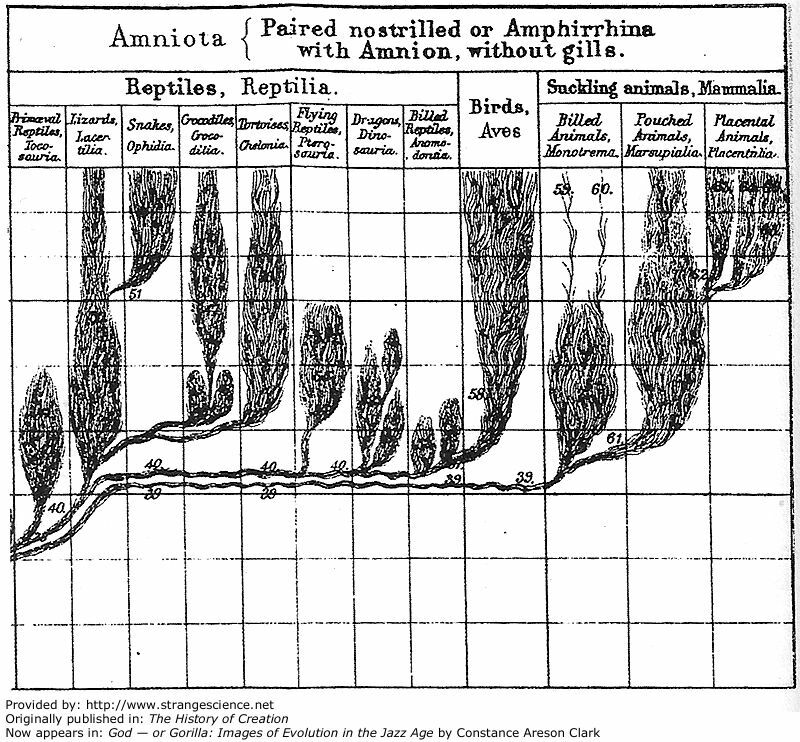 German zoologist Ernst Haeckel claimed that "ontogeny recapitulates phylogeny," or that an animal's embryological development repeats the stages of its ancestral evolution. This picture comparing embryos was intended to support that view. In early stages, vertebrate embryos look similar, but not nearly so similar as Haeckel claimed. 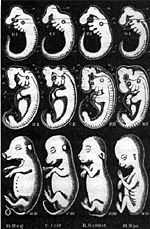 (In the first edition of one of Haeckel's books, an identical woodcut was accidentally duplicated for three different types of embryos, a blunder that dogged Haeckel for years.) Though embryologists recognized problems with this depiction when it was published, and Darwinian evolutionists abandoned the ontogeny-phylogeny link early in the 20th century, Haeckel's drawings still managed to populate many biology textbooks. 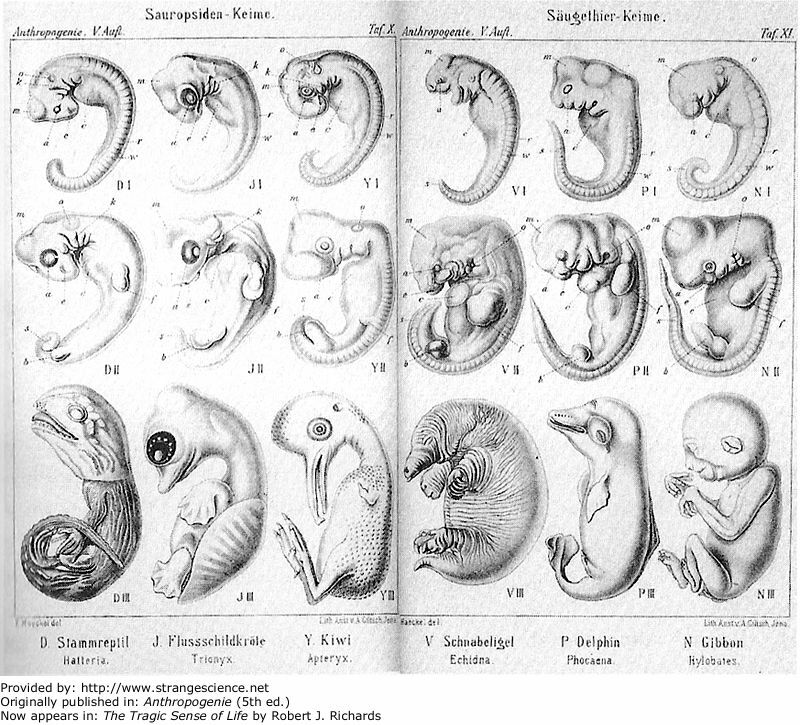 Haeckel came under fire for this embryo comparison, for excluding the limb buds of the echidna embryo. Nevertheless, this depiction was a substantial improvement over versions that had appeared in earlier works. 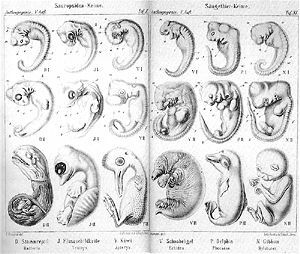 As graphic techniques improved, so did the embryo renditions. 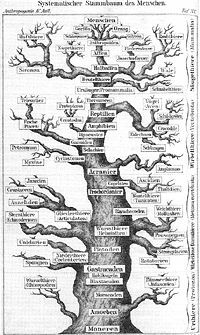 Another way in which Haeckel gave 20th-century paleontologists and evolutionary biologists heartburn was by publishing this tree of the ancestry of humans. The thick trunk culminating in the human species suggests that evolution's only aim was in making us. 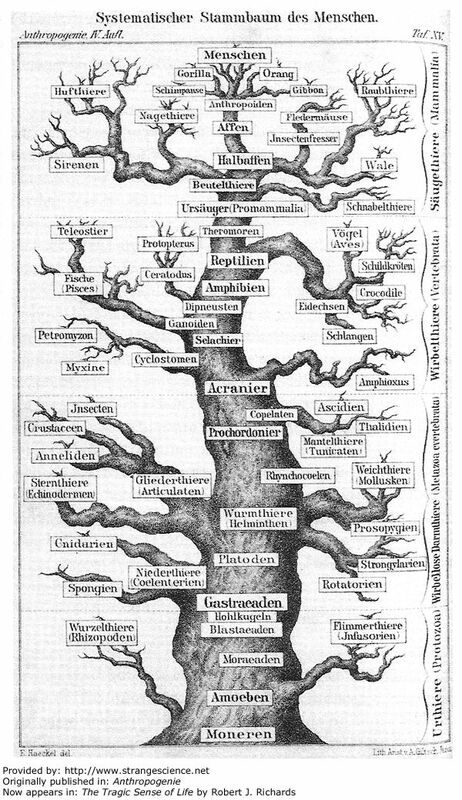 In fact, this was one of many diagrams Haeckel published, and his view of evolution was much less anthropocentric than this diagram implied. 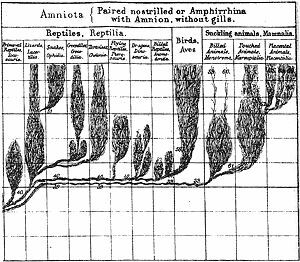 Also less widely reproduced than Haeckel's human-centered tree diagram, this fernlike diagram of amniotes has been cited as a more accurate view of the diversity of life. This is a depiction of life in the Eocene epoch, roughly 45 million years ago. 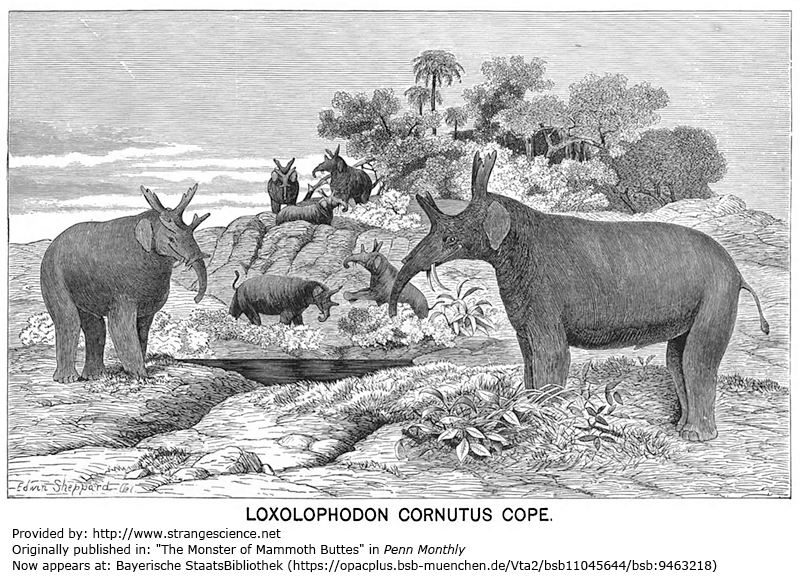 The largest animal to the left is a Uintatherium. The velvet antlers are a mistaken addition, but the many bony protrusions, surprisingly, are not. This Uintatherium giganteum diagram appears inside Gunning's book, in Figure 17. Describing the figure, he wrote, "Fig. 17 represents a skull very long and narrow; facial parts very strongly pronounced; three sets of horn-cores, one rising from the nasal bones (1), one from the maxillary (2), and one from the parietal (3); an enormous crest above the brain-case; huge descending canine tusks (4) in the upper, and small molars with slender roots in each jaw; small under jaw supporting a massive underhanging bony process (5)." In fact, much of Figure 17 is correct, but it repeats Gunning's mistake of envisioning antlers rising from the parietal horn cores. 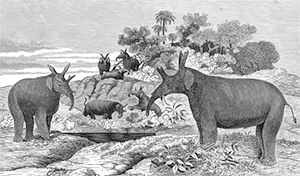 Few modern paleontologists would argue, though, with his description of Uintatherium giganteum as showing "a strange assemblage of characters." "What's this thing doing in a page about mammals?" you might wonder, but although this sail-backed creature has often been lumped into the same category as dinosaurs by toy makers, it's a protomammal — not a mammal, exactly, but a forerunner. In these depictions, the sail itself is missing, and only the supporting spines appear, but it's impossible to dislike a picture in such pretty pastels. In the early 20th century, Harder produced sketches and watercolors as part of his original plans for the Berlin Aquarium, an Art Nouveau building that opened in 1913. The original structure might have survived had it not been for World War II, but the Allied bombing of Berlin in 1943 destroyed the building. In the 1970s, some of Harder's original plans came to light including this sketch (top). 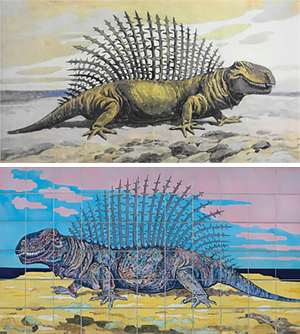 A director of the rebuilt aquarium undertook a campaign to recreate the original murals, appealing to the public for any old pictures or postcards that might help. In 1982, the recreated murals were unveiled, including this cheerful-pastel mural (bottom). It preserved Harder's mistake of omitting the sail's soft tissue. The late-19th-century Cope-Marsh Bone Wars weren't just about dinosaurs. Trying to best each other in naming new fossil species, the paleontologists named extinct mammals, too, sometimes naming the same species multiple times. When an extinct animal was adorned with puzzling protrusions, the problem of competing names worsened, especially if names were based on partial finds preserving different parts of the body. Reconstructing the extinct animals could be as difficult as naming them appropriately. Loxolophodon cornutus was the species name Cope applied to this animal, which is now known as Eobasileus cornutus. Related to the equally bizarre Uintatherium, this prehistoric mammal bore illogical skull extensions. In this case, the antlers were actually correct, but the elephant-style trunks and ears were abandoned by later paleontologists. This "tiger" was based on an earlier, slightly more accurate drawing of the real beast. In making the woodcut, the artist Piso employed put the tiger's stripes into the shadows of the animal's muscles. In the original drawing, the tiger's head didn't quite match the shape of the real cat's, but this woodcut changed the shape even more. Europeans might have been surprised to learn of a donkey-like animal with black and white stripes. This zebra appears equally surprised, and looks reproachfully at the reader, as if to ask who played the prank of striping his coat. For a depiction of an unfamiliar animal native to a different continent, however, this picture wasn't too bad. Believe it or not, this was supposed to be an elephant. It's a safe guess that the illustrator of this medieval manuscript hadn't seen the actual animal, at least not with a clear head. But he might have seen an elephant tusk, and confused it with the animal's trunk. 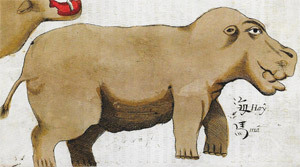 This dog-like creature appeared in an illustration of "the wonders of India" and to the 15th-century European mind, India was the epitome of exotic locales. Although this depiction preceded Vincent of Beauvais's by about two centuries, it was somewhat closer to the actual creature. Still, this image had its drawbacks, including a trunk that looked like a trumpet. In the days of Ancient Rome, elephants had been used in Europe in warfare and kept as status symbols by the powerful. Perhaps saddest of all, elephants were used in gory spectacles — tossed into arenas with felines and bears. (Romans wanted to see which animal would finish off the others.) After the fall of the Roman Empire, elephants became much rarer in Europe, to the point that most Europeans had no idea what the animals looked like. This sad, earless elephant balances a castle on its back while trying to catch a winged dragon. The animal's melancholic expression might reflect the daunting tasks it's trying to complete, or dismay that it can't hear anything. In fairness to the artist, though, this picture provides a reasonably accurate rendition of the elephant's trunk, except for the tip, as well as the tusks, overall body shape, and ability to carry heavy objects. Big, sad eyes in art preceded Margaret Keane by several centuries. Published multiple times, Tractatus de Herbis was an herbal aimed at helping apothecaries and other healers spot the plants they needed for their patients. One version of the herbal, produced in northern Italy, was largely text free, relying instead on detailed illustrations of plants, sometimes next to small illustrations of the conditions they could treat. But not every illustration in the book dealt with healing herbs. 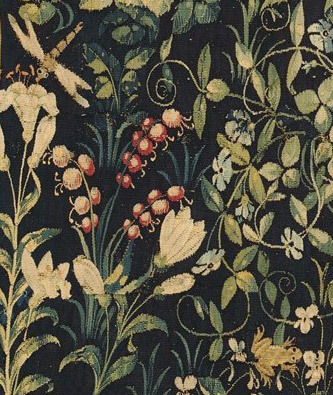 The herbal included a multitude of miniature animals, some familiar, some strange. 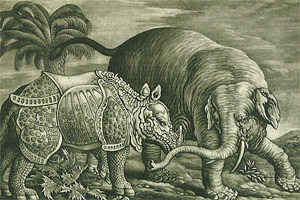 This illustration includes a couple — but only a couple — features identifying it as an elephant. Aside from the trunk and tusks, almost everything else — the small pointed ears, the long fur and the paws — belong to animals that Europeans likely found more familiar. This strange, scowling proboscidian appeared on the same page with a couple other exotic mammals, namely a lion and a very sophisticated-looking leopard. 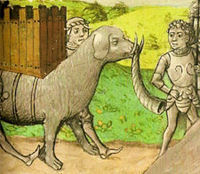 For a 14th-century European illustration of elephants, this depiction is impressively accurate. But it illustrates the medieval myth that expectant elephants would give birth in water to protect their babies from winged dragons. 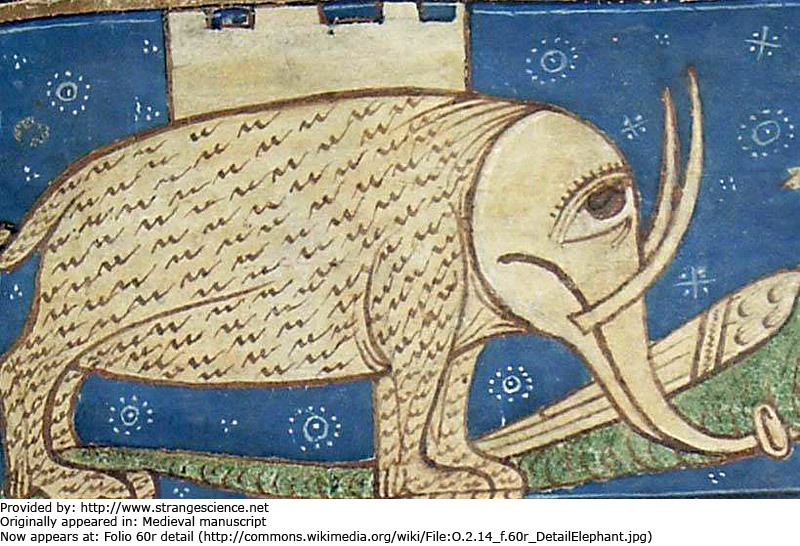 Dragons picking on elephants was a persistent theme in medieval bestiaries. This rather unfriendly looking elephant was a pretty good depiction for its time. Paré didn't describe the elephant with complete accuracy, but some of his observations rival those of today: "They surpass in largeness all other four-footed animals; nevertheless . . . they can be so readily tamed that they remain the most gentle and tractable of all beasts; one can teach them, and they understand how to carry out several charges." This illustration also appeared in Conrad Gesner's work, and Paré likely borrowed it from there. 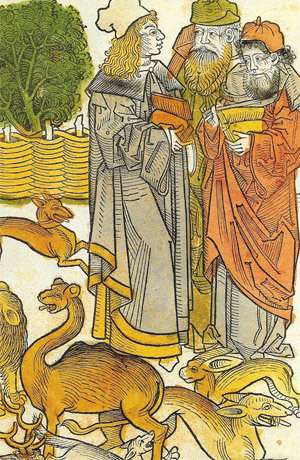 This woodcut pair in Pliny's book showed pretty accurate views of the giant animal. Even though he lived in Antiquity, Pliny remained enormously influential during the Middle Ages and Renaissance, and with good reason. Elephants were a more common site in Antiquity than in the two millennia that followed. 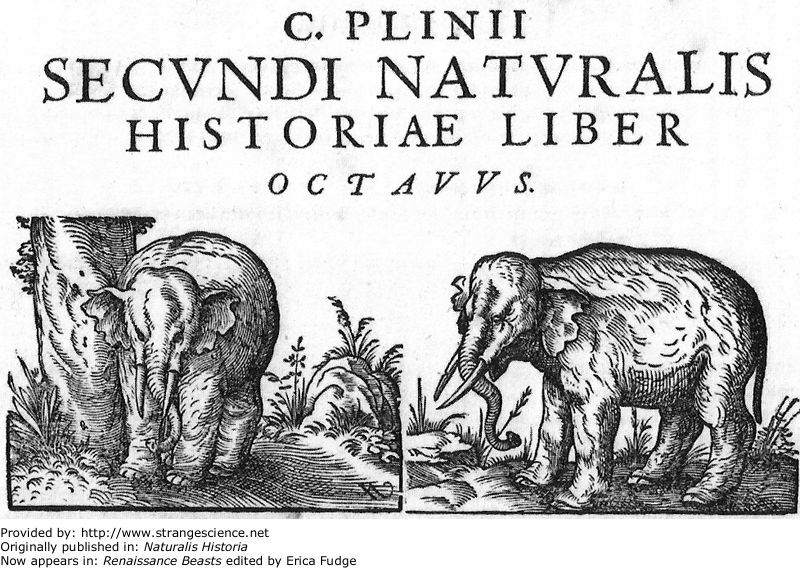 So while Renaissance greats Gesner and Aldrovandi had probably never seen an elephant, Pliny probably had. Yet Pliny might not have approved of this illustration — he disliked illustrations in general. And with or without illustrations, he passed along odd information about pachyderms. Just one example: one elephant wrote a happy note (in Latin!) in the sand describing its glee over the defeat of the Celts. This elephant appeared in the same picture as a unicorn. Polo apparently recalled both animals from his travels. The illustrator apparently grasped the prehensile nature of the elephant's trunk, and in this picture, the end of the trunk looks almost like a human hand. The feet, meanwhile, look like giant paws. 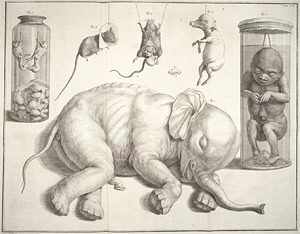 This picture presents an odd mix to the modern viewer, showing the fetus of an elephant next to the fetus of a human inside a jar. The 17th- and 18th-century Dutch apothecary and collector Albertus Seba might judge the modern viewer squeamish as these fetuses counted among his prized possessions. Lavishly illustrated volumes of Seba's Thesaurus show not just items in his collections, but even some type specimens — the examples of species — that the 18th-century naturalist Linnaeus named with his system of binomial nomenclature. 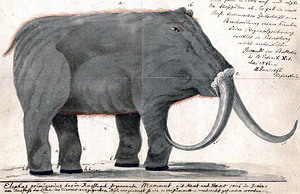 One specimen, which Linnaeus named Elephas maximus, was pictured in Seba's book, and the specimen itself has been preserved to the present day. The Swedish Natural History Museum in Stockholm still houses the elephant fetus, but its days as a type specimen are now over. When Linnaeus named Elephas maximus, he believed there was only one elephant species in the world. Subsequent naturalists recognized that African elephants differed enough from Indian elephants to be placed in their own species and later their own genus, Loxodonta, and eventually split African elephants into two separate species. Biologists can easily distinguish African from Indian elephants based on their ears and the shapes of their heads, but identifying the species can be harder in a fetus. Nevertheless, biologists long suspected that the pickled elephant might be named incorrectly. DNA analysis proved their hunch correct, although finding good DNA to sample was tricky. Alcohol may preserve animal tissue for a long time, but the liquid is tough on DNA. Diagnostic tissue — a protein known to differ in Asian and African elephants — was finally located in the little elephant's esophagus. The collections of the Cloisters of the Metropolitan Museum of Art includes a stony arch, rumored to be from a church at Narbonne. Dating from around the late 12th century, the Narbonne arch includes an assortment of real and imagined animals. Clockwise from the lower left, the arch includes a manticore, pelican, cockatrice, siren, griffin, amphisbaena, centaur and lion. 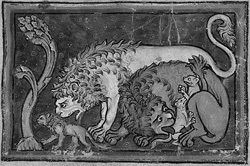 The lion, of course, is a very real animal, but this depiction indicates that medieval Europeans had scant experience with lions in the wild. A lion in the wild wouldn't hesitate to make a meal of you, even if you were a woman, a child, a prisoner, or even a shrewd soul who politely prostrated yourself before the kingly beast. 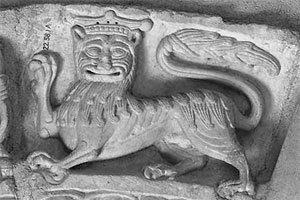 A lion in the wild wouldn't wear a crown, though this cheerful cat does. The animals shown in this arch reflected tales from bestiaries. Kingly and kind, lions still had their eccentricities, the typical bestiary reported. From the Metropolitan Museum of Art: "Although the lion was considered brave — as seems to be the case here — it also feared fire, human hunters, creaking wheels, and white roosters." 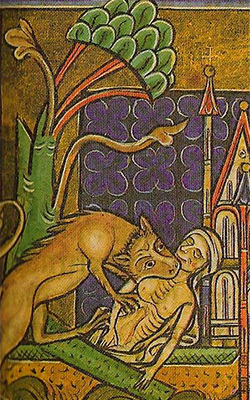 Medieval bestiaries occasionally relayed objective observations about animals, but more often used the creatures to make a moral argument. This picture illustrates a common legend, namely that lion cubs are brought to life by the roaring and breathing of their fathers. In a society infused with Christianity, it's not hard to imagine who the lion fathers represented. The little tyke on the far right certainly looks like he's just been on the receiving end of a mighty roar. 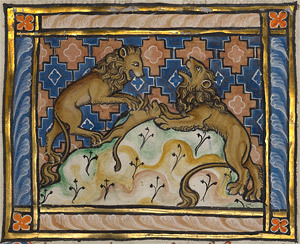 Another depiction of the lion's legendary fathering skills appears in this gilded illumination. The mother, having given birth to a lifeless cub, looks heavenward while the father inhales, preparing to breathe life into the newborn. In fact, the cub is three days old. The Getty explains, "The lion, the king of beasts, was understood in the Middle Ages as a symbol of Christ. So the story of the cub's three days of lifelessness was interpreted as a reflection of the three days between Jesus' Crucifixion and his Resurrection. Few Europeans ever saw lions, native to Africa and Asia. Nevertheless, the artist rendered the beasts with remarkable verisimilitude." That both the mother and father have manes is a forgivable mistake. Unfortunately for European education of the time, this was supposed to be a giraffe. 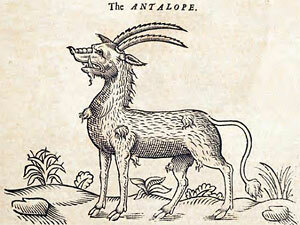 Reuwich apparently tried to depict the animal from memory and remembered an antelope better. 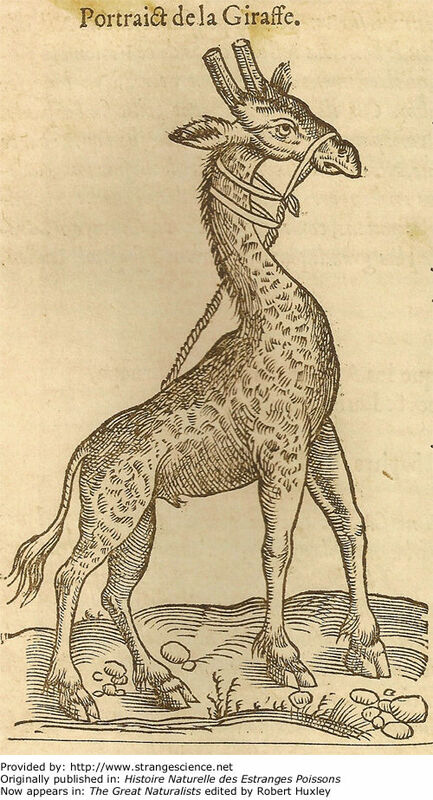 Given how unusual giraffes are, and how few 15th-century Europeans saw one, this illustration may have been regarded as far more plausible than the real thing. In Reuwich's day, woodcuts weren't exactly copyrighted, and the same picture could easily appear in multiple books. This image also appeared in works by Conrad Gesner and Edward Topsell. 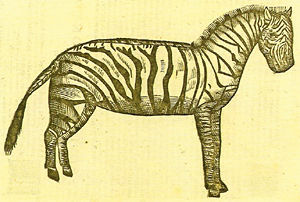 Originally made in the 16th century, this woodcut later appeared in the book Edward Topsell published in 1607, along with Reuwich's antelope-like giraffe. This depiction was much closer to the mark, although — given the tiny human for scale — this giraffe appears closer in size to a typical Jurassic sauropod than a modern giraffe. 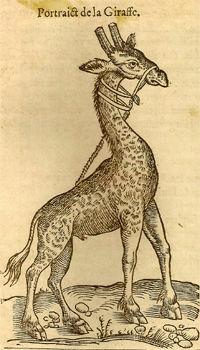 Though still not perfect, Belon's 16th-century rendition of a giraffe was more accurate. The neck is too short, but the head looks more like a giraffe's, and this picture hints at the correct color patterns. This porcupine isn't a bad rendition. 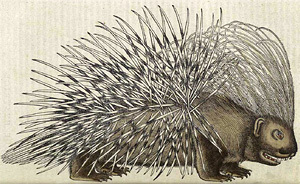 It not only shows the finer hairs near the porcupine's head, but also the black-and-white coloring of the quills. The face looks a little ferocious, but given the porcupine's arsenal, 16th-century Europeans can probably be forgiven for thinking of this occasionally cuddly creature as bad-tempered. 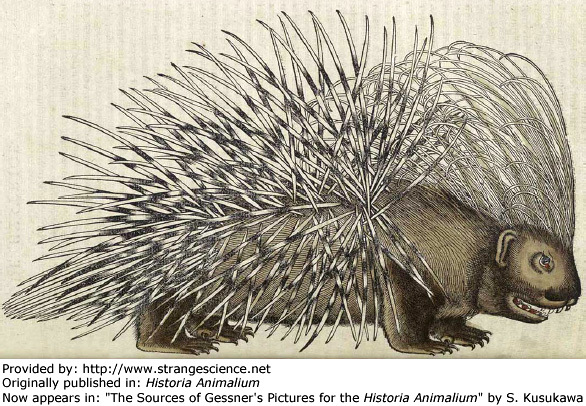 The woodcut was apparently modeled on a porcupine shown around Zurich by a beggar who likely valued money over comfort. This wild boar illustration wasn't too bad. At the time it was published, however, Europeans held some nutritional notions that would strike a modern reader as strange. One idea was that eating an animal's brains would make you smarter. Another was that the ideal food to consume would be most like yourself. That would be humans. It doesn't appear anybody took that advice seriously enough to actually feast on human flesh. But pork was considered the next best thing. This ferocious version of a hippopotamus was called the behemoth, "the largest of God's creatures." In all fairness, the real hippo does have large teeth in its lower jaw, and it can be aggressive, although the real animal doesn't look quite this scary. Born in Poland, Boym joined the Jesuit order and eventually became a missionary to China. Before traveling to the Far East, he spent some time in Mozambique, which was probably where he observed the hippopotamus. Despite its habitat on a different continent, the hippo figured in his book about Asia. The overall shape of the animal is pretty accurate, though it has a strangely humanlike eye and equally humanlike eyebrow. 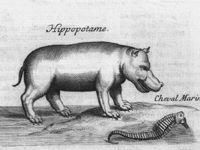 Seventeenth-century German Jesuit polymath Kircher described an equally weird hippopotamus in his book about China, describing the "marine horse" as "completely deformed and horrible to look at." 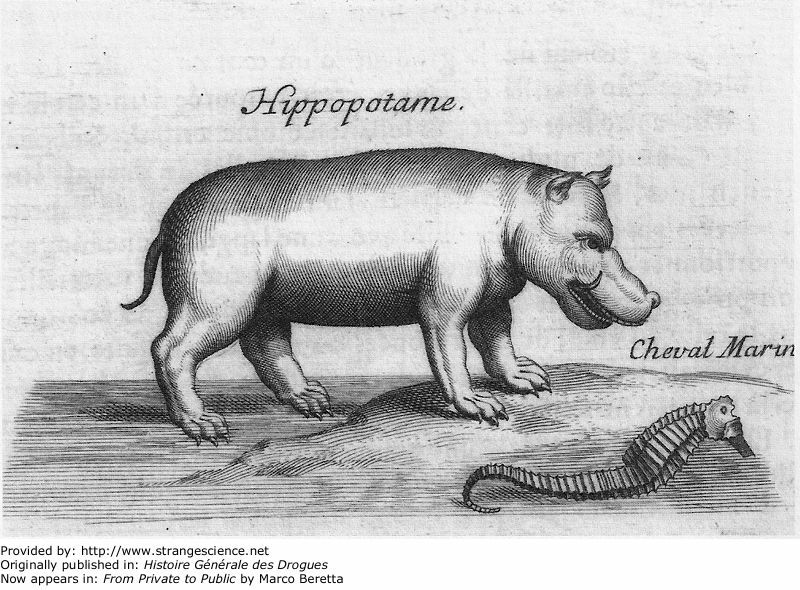 Far more accurate than Kircher's hippo, though still a little fanciful, Pomet's hippo appeared just a few decades later. The creature next to it is pretty recognizable as a seahorse. In the early 16th century, a Portuguese official based in India relayed to his king, Manuel I, an Indian rhinoceros. Remarkably, the animal survived the 120-day sea journey to Lisbon. Manual I re-gifted the beast to Pope Leo X. The beast was one of several spectacular gifts plucked from the far reaches of the Portuguese empire. Sadly, the much shorter sea journey to Rome ended in failure. The ship sank and the animal perished. (Some people even blamed the rhino for the sunken ship, claiming it threw its weight around until the vessel capsized.) Its body was later recovered and its hide stuffed for display. A sketch of the rhino reached the famed artist Dürer, who then made this woodcut. Although this woodcut shows an unusually stout rhino with griffin-like legs and an ornate hide, it's really not a bad likeness. The reason its skin looks like armor may be that the animal described really had been outfitted with its own protective suit. Dürer, who did not personally see the rhino, actively marketed his depiction in the form of leaflets with sensational text describing this "deadly enemy of the elephant" exuberantly goring the proboscidian at every opportunity. Dürer's much-admired picture appeared in later works by Ambroise Paré and Conrad Gesner, among others. Dürer's rendition of the rhino may have had a few weaknesses, but it was far superior to the picture in the pamphlet published in Rome the same year. The artist behind this woodcut is unknown, but the author of the pamphlet's poetry was Giovanni Giacomo Penni. He apparently had seen neither an actual rhino, nor Dürer's woodcut. 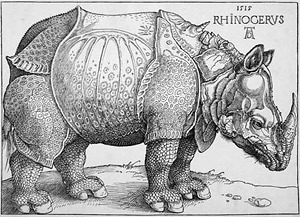 Forty years after Albrecht Dürer's famous print, the rhinoceros worked its way into a compendium of emblems, associated with Alessandro de Medici. This emblem gave prominence to a minor feature in the earlier print: its second horn. The small protuberance on the rhino's back might have been a cyst or skin flap, though it's often been associated with the unicorn. In this emblem, it does look very much like a mythical unicorn horn. Originally published as: "A True Representation of the Two Great Masterpieces of Nature . . ."
This mezzotint had a long title, and part of the title (besides "true representation") was "drawne after the life," as if the artist had personally eyeballed these great masterpieces in the flesh. More likely the artist eyeballed Albrecht Dürer's 16th-century representation of a rhinoceros, in which he added armor. The overall shape of the rhino is pretty accurate, and the same goes for the elephant, though this elephant bears an awful lot of wrinkles. These fighting beasts exhibit the animosity they'd been assumed to feel for each other since the days of Pliny. Two centuries after Dürer's engraving, a more accurate one appeared in Diderot and D'Alembert's encyclopedia and Buffon's Natural History . Unlike the 16th-century rhino, this depiction was based on a specific animal, Clara, who took a tour through the best courts and cities of Europe. One contemporary account described her as a wonderful animal who could plow the ground with her horn. Another described her as a "hideous animal of the female gender." Clara was a generally placid, good-natured animal, but her charm was hardly enhanced by the moisturizer used on her thick skin: smelly fish oil. This illustration shows a rhinoceros, purported snake stones (believed to come from behind the eyes of vipers, and supposed bezoar stones (thought to form in animals' intestinal tracts, made up of indigestible materials). To the modern viewer this assemblage looks miscellaneous, but to the doctor Sloane, all the items were related. Sloane thought the snake stones could counteract fevers and, not surprisingly, venom. He argued that the bezoars could draw substances out of the body, and could be particularly helpful in childbirth — though they had to be used with caution lest they coax out more than the baby. He also said that shavings from the rhino's horn could cure poison. Despite the misinformation in Sloane's argument, the rhino illustration relayed some accurate and fairly novel information: A rhino could have two horns. Renaissance and Enlightenment Europeans were more familiar with one-horned Indian rhinos than two-horned African rhinos, and many scholars assumed that accounts of two-horned rhinos from Antiquity were in error. Topsell described two types of camels: the two-humped (Bactrian) camel and the one-humped (Arabian) camel, or dromedary. His depiction of the animal wasn't too bad from the shoulder backward. But the head and neck didn't quite match the rest of the animal. Or much of anything else normally seen in nature. Topsell wrote, "A camel is a gentle and pleasant tame beast whereof there are plenty in Africa especially in the Deserts of Lybia, Numidia and Barbary by which Africans estimate their own wealth." Lurking in one of the many woodcuts from this late-15th-century book, part of a menagerie of exotic fauna, is a camel. It's clearly recognizable, though its ears are a little big and its neck is a bit too long and too serpentine. Looking at the human figures for scale, this camel is roughly the size of a dog. That could be an error, but it might just be artistic convention of the time. In the Middle Ages and early Renaissance, symbolism trumped realism, and a figure's size often had more to do with its importance; if the human figures mattered more, they would get more space. 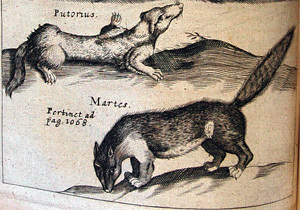 Naturalist Faber had his doubts about the New World creature known as the "Mexican dog," but he portrayed it like this anyway, largely because he (mis)trusted his source for the illustration. This picture was based on copy by Nardo Antonio Recchi of an original by Francisco Hernández, made in the 16th century. The gulon, or glutton, was likely based on the wolverine. The creature was believed to be so gluttonous that it would eat its fill, pull its body between two branches to clear its guts, and go back for more. Here the creature is seen copiously depositing tokens of its esteem around the carcasses it has eaten. Topsell believed that many beasts existed to give moral instruction to man, and the gulon was a shining example. "It may be that God has ordained such a creature in those countries where it is found to express the abominable gluttony of the men there, so that they may know their deformed nature," he explained. No prisoner of political correctness, he continued, "Such are the men in Muscovia, in Lithuania, and most shameful of all in Tartaria." Verbiest was a Flemish Jesuit who, like his brothers in the Society of Jesus, was welcomed in China's imperial court for his knowledge of topics such as astronomy and math. 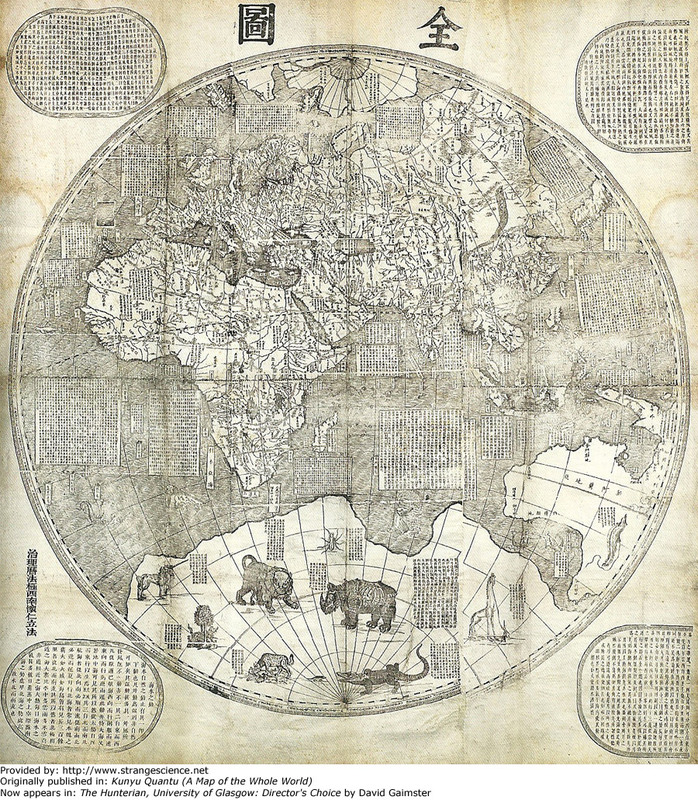 The Jesuit missionary-Chinese cartographer collaboration produced a map showing continents as they were understood in the 17th century: Eurasia, Africa, America and a massive southern continent called Magellanica. This map continued a centuries-long belief that the landmasses in the Northern Hemisphere were counterbalanced by an equally large landmass in the Southern, even though it hadn't yet been precisely located. Before discovering that Antarctica was (1) much smaller and (2) much colder than Magellanica, cartographers could easily imagine the place was home to animals akin to what had been found in Africa, along with some mythical creatures. 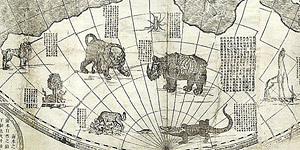 Inhabiting Magellanica in this map section are animals that had appeared in 16th-century encyclopedias, including a giraffe and a heavily-armored rhino. Alongside them are a unicorn, a gluttonous gulon, and a giant arachnid. An amateur collector claimed to have found a deer whose antlers looked eerily like foliage. 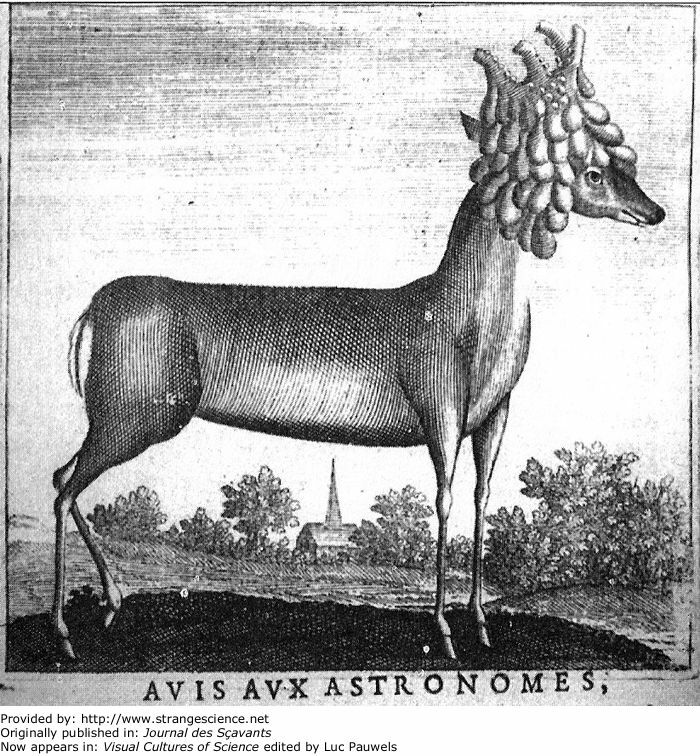 Aldrovandi later published this picture of the deer, foliage intact. Science historian Francesco Panese has observed, however, that Aldrovandi's readers didn't necessarily believe they were seeing an accurate depiction. 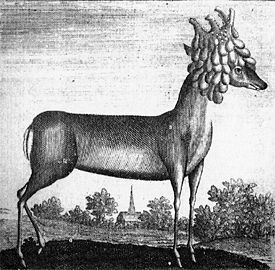 Leibniz explained that this deer had been shackled for charging passers by and, as a result, developed odd protrusions. He likened it to prisoners remarking upon stories that "teach us that great sadness or anxiety can cause the color of a prisoner's hair to change overnight." More specifically, "its aqueous humour could no longer be dissipated once the animal was attached as it usually is by the heat that such animals generate by means of their charges, leaps and runs." 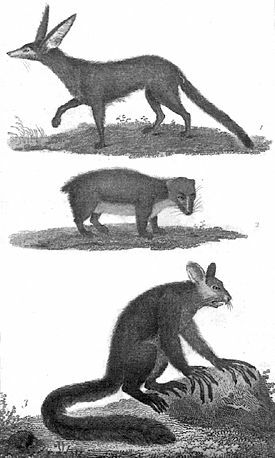 This image, published decades after Buffon's death, shows three odd-looking mammals from faraway lands: the Saharan fox, the Syrian hyrax, and Madagascar's aye-aye. This fox's ears are so big, they apparently must be a mistake. They are oversized in this picture, but only just. Saharan foxes actually sport disproportionately large ears help the animal dissipate heat. Likewise, the aye-aye looks like a mistake, too, but the real animal looks no less strange. The animal's elongated middle finger (used for fishing grubs out of tree limbs) prompted comedian and lemur enthusiast John Cleese to tell one modern specimen, "Being born with your very own chopstick was very clever." "No one in medieval Europe ever saw a lion or an elephant or a panther," remarked Odell Shepard in his book on unicorn legends. This picture lends a little credence to that assertion. Although felines are generally fit animals, this one looks like a steroid user. This detail is from an engraving, based on a first-century mosaic, that focused on activities surrounding the annual rising of the Nile. 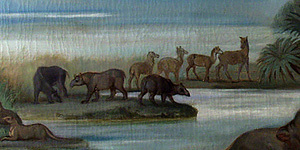 Included in the artwork were some odd looking mammals not easily related to real species. Easier to relate to the real world are the spears stuck into them. 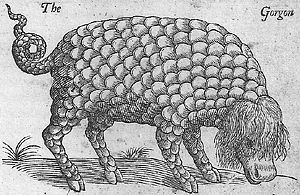 Long before Kircher produced his armadillo illustration, Clusius portrayed this illustration, though perhaps of a different armadillo species. The legs in this rendition are a little too long, and the fur a little too short. 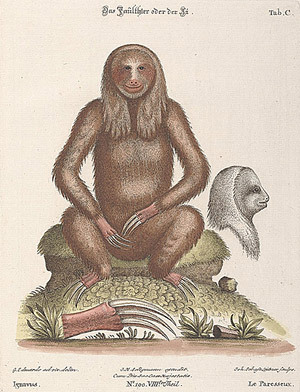 Meaning the illustration, though it has its errors, is probably less weird-looking than the actual animal. 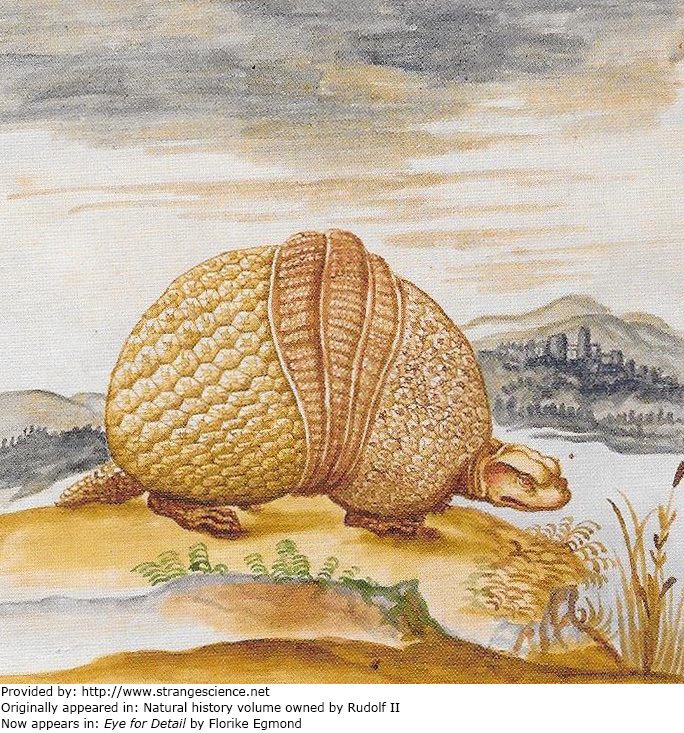 This armadillo picture is pretty respectable for the 16th century except for two things. One, its head is all wrong. Two, it's labeled as a sea turtle. The animal occupies a landscape of lakes and hills, with what looks like a European town in the distance. 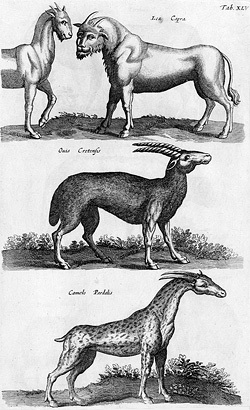 Topsell, who published much of Gesner's work, supplemented Gesner's woodcuts and descriptions with additional creatures. 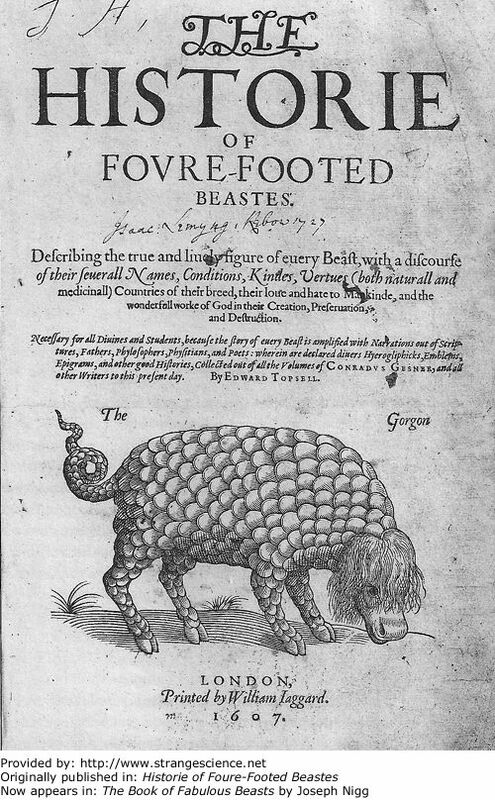 This "gorgon," appearing on the title page of the 1607 edition of Topsell's book, more closely resembles another mythical beast: the catoblepas. Like the basilisk, this animal was believed to have a lethal stare. Italian academic and physician Marcello Malpighi undertook microscopic examinations, producing exceptional illustrations that advanced understanding of anatomy and botany. This frontispiece to Opera Omnia was not one of them. 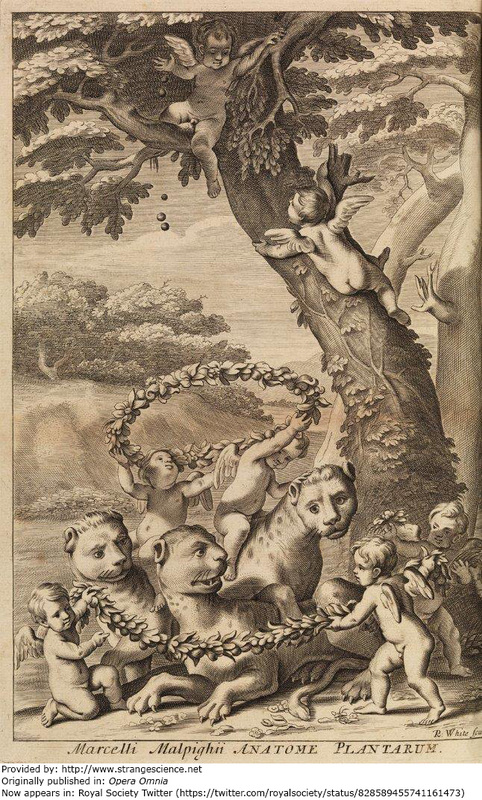 In Malpighi's defense, the image is allegorical (it has cherubs after all) but it's tricky to imagine how he conjured these long-necked, funnel-eared felines frolicking with little angels. Malpighi was a fellow of the Royal Society of London, and his works remain in RSL archives. When reading this Bodley Bestiary passage, one doesn't know which misconception to find more alarming. "There is an animal called the hyena, which lives in the graves of dead men and feeds on their bodies. By nature it is sometimes masculine, sometimes feminine, and for that reason it is an unclean beast. . . . The children of Israel are like this beast; at first they served the living God but later fell prey to riches and easy living and worshipped idols."